As I walk through a rainy street in South Manchester it suddenly dawns on me that I’m home. It’s taken 3 days. I don’t know what prompted it. Running out of milk, a conversation with family, who cares. I’m back and that’s it. I’m not in Antarctica any more. Exactly two weeks earlier I was standing in the launch bay of the Ocean Endeavour, a former Baltic sea ferry turned Antarctic cruise ship. It was moored off Neko Harbour, a stunning spot on the Antarctic mainland. You can walk all the way to the South Pole from there if you wanted. We were here for different reasons though: following a team of scientists as they set up remote cameras all over the Antarctic Peninsula. As far as working as a BBC cameraman goes, this is as good as it gets. It’s a long way from Rotherham Magistrates court – literally! 4 flights and 2 days at sea crossing the Southern Ocean. It’s at the end of this voyage where I’ll start my little diary. Most of it was written on board the ship during the trip. Pics are by my wonderfully talented colleague Vic Gill. So that was unpleasant. The Southern Ocean is quite rough! The winds are unimpeded right around the globe at that point on the map and you can feel them through the roll of the huge waves that collide with the ship every few seconds. Vic managed very well but I felt bad. I wasn’t sick, unlike many of the other passengers on board, but I did turn in to a shell of myself. I think Vic asked me if I was OK about 5 times a minute for the whole day. Still, we managed to prepare our camera kit, including all the biosecurity measures ahead of taking it ashore, and I even had lunch and dinner, so I can’t have been that bad. Vacuuming all traces of seeds and debris from my camera equipment. Part of biosecurity measures taken by the expedition team. As I crawl into the cabin to go to bed I have an Alan Partridge-style ‘idea for a programme’ – put fat people on ships sailing to and from the Antarctic peninsula non-stop until they reach their desired weight. Possible title – Fat at sea/Land Ahoy/Chunder blunders? Good night. There couldn’t have been more of a contrast to yesterday. We awake to the soothing sound of the Expedition Leader, the amazingly super cool Alaskan, Solan Jensen, who announces over the ship tannoy, “Welcome to Antarctica’. It’s like Disneyland out there; the sun is shining and the visibility is excellent. It’s the ultimate way for the continent to greet you, and a great way to celebrate reaching the last of the 7 continents of the world (it turns out both myself and Vic have achieved this feat without realising). We have breakfast then quickly prepare for a full day of work following scientists Dr Tom Hart and Hila Levy from University of Oxford. They are heading out to collect memory cards from a variety of cameras which are fixed on penguin colonies, and monitor the birds 365 days a year. After a quick safety briefing we head out on small, fast rubber boats called zodiacs and land ashore at Neko harbour. Penguins are fascinating birds. They are undeterred by the strange human visitors, and carry on doing their thing. We get some beautiful shots of them, and of Tom and Hila setting up their kit, before heading back to the ship. The place is stunning in the sunlight. It’s hard to imagine it being a harsh environment… ever. But that’s what it is most of the year. This bright sunshine is very rare, Tom assures us, and things can change very quickly. I suppose that’s why we are lugging around extra clothing and bivvy bags everywhere. In the afternoon, we head out on another zodiac trip to set up a brand new camera position at Bryde island. Hila’s sense of humour starts to emerge when confronted with the task of collecting penguin guano (poo to you and me); more about that tomorrow. In the evening, we have to abandon dinner to go to Leith Cove where the tourists are setting up to camp over night. Yes, tourists do get the chance to camp out in Antartica, under the stars in bivvy bags. I’m impressed by the numbers, a few dozen, and by the organisation of the expedition team. They dig toilet igloos and are there to help out in what must be a fairly complicated operation. We move on to take time-lapse shots for the opening of our news piece. There is a huge ‘crack’ as an iceberg splits in two and rolls over in the bay in front of us. It is summer here, so of course the ice is melting. Going close to the edge of an ice sheet is not a good idea as a crack can very quickly lead to a chunk of ice cleaving into the sea. It happens every few minutes meaning the campers behind us will have to get used to the sound. Or not sleep very much. As we head back to shore in the zodiac, an Antarctic Petrel decides to fly right above us, tracking the craft at it speeds toward the ship. It’s an amazing sight I’ll never forget. I kept thinking of reaching for my camera to film it but I’m glad I didn’t. Some things are better watched than captured and this was one of them. Truly wonderful. Tomorrow promises to be even better, if that’s possible. It’s our second day and we are now amongst sea ice in Gerlache straight and the ship is sailing up the Lemaire channel – a narrow strip of water between two vast icy walls which loom out of the low cloud. The bottleneck provided by the channel leads to increased sightings of marine life. A pod of Orca are spotted and soon are right next to us, spouting and surfacing as they feed. Penguins dart in and out of the water and we see seals cruising all around us. As we get further down the channel, the ship suddenly feels tiny and vulnerable. Up ahead is a vast sheet of sea ice blocking our way. At this point myself and most of the tourists around me are thinking one thing: stop and turn around. But instead we ram on through it, using the weight of the ship and some expert knowledge from the captain to break up the ice and sail through. It’s quite a unique experience to see ice, covered in penguins and seals, either side of the ship as you sail through. Later that day another landing – Booth island. This time we travel light prepared for a hike through the snow. The zodiac drops us off, snow shoes are donned and off we go. The team are setting up more cameras, but also Hila will be taking samples of guano – penguin poo and collect DNA samples. To do this she has to swab the penguins, both adults and their chicks, where the sun don’t shine. Not an easy prospect! There are two methods. Number one: one scientist (Tom) distracts the nesting penguin while the other (Hila) sneaks up behind with a long cotton bud and takes the swab. Textbook! Number two is the trickier prospect of swabbing the chick which sits underneath in the warmth. Tom gently holds the beak of the penguin to avoid a nasty peck, Hila nips in with the swab and they are out of there within seconds. It’s impressive. We’re soon back on the ship, fed and watered. The day ends with an amazing sunset. To get the really good shots, any camera operator or photographer will tell you to wait for sunset or sunrise. I usually prefer sunset, as I don’t like getting up in the morning. Trouble is, this far south in the Antarctic, the sun sets REALLY late. Midnight to be precise. And the process takes an age. So instead of having the usual 5 minutes of beautiful light and the mad dash to get as many shots in that window as possible, you can take your time. A photographer’s dream! That night we probably have the best part of an hour of phenomenal light with the most wonderful colours. And in a place like this it takes your breath away. I hope we can do it justice on film. I shouldn’t have had a few beers last night whilst waiting for the sun to go down. The soothing voice of Solan over the ship intercom at 0700 isn’t as delightful as other mornings. And the news that we are heading out to shore early isn’t what I wanted. Vic, though, is up and at ’em. I don’t know where she gets the energy but, since she has it and is a very good video journalist/camerawoman, why not make use of her skills! I stay on board and film from the ship whilst Vic, Tom and Hila disembark on the zodiacs and do science. Nice. They head off to a spot called the Yalores to check on a camera which has the ability to relay images via satellite: the next innovation which could lead to live images of penguin colonies online. Meanwhile I get a few cups of coffee and get the shots of them speeding to and from the ship which will be perfect for our documentary. The great thing about this shoot is everyone is wearing the same clothes every day. Red jackets, snow pants, same hats/gloves/sunglasses/boots. It’s a dream for continuity. In the afternoon we head to civilisation…Antarctic style! Vernadsky research base is a Ukrainian research station which used to be British (Faraday station). The science geeks amongst you will know that this is the place at which the hole in the ozone layer was discovered. We jump ashore and head in. We are immediately greeted by some friendly Ukrainian scientists doubling as bartenders. Vic has a glass of wine but is sure, despite their flat denials, that there must be some of their famed vodka kicking around. Tourists enter and began hoovering up tat from the world’s most southerly gift shop. You can buy postcards with stamps and post them from here (keep an eye out, mum). The scientists even carve their own penguin fridge magnets during the long, boring winters. I’m having one of those. We interview some of the scientists and are soon led into the back of the base to have a look at a piece of history. Up a ladder and into a loft we are led into the bedroom of Sascha. Perched barely a metre above his bed is a huge white machine. Yes… this is the the machine which detected the hole in the ozone layer!…In some Ukrainian guys bedroom. Unbelievable. Me, Vic and Sascha with a piece of 80’s history. The machine that led to the discovery of the hole in the ozone layer. With so much good footage in the bag, we decide to spend the morning editing. Last night we went to a place called Moot Point (yes, really). It was the most remote penguin colony so far, and getting there had involved weaving through masses of sea ice and icebergs in a zodiac. It was truly impressive navigating from Solan, who was driving us, and great fun. I have brought along a DJI Osmo camera for this trip, and it proved ideal for this particular foray. It’s basically the gimbal camera that is usually attached to a drone. But this you can hold in your hand. It gets you rock steady shots from a moving platform, like a zodiac, and is really easy to grab and use. Filming with the DJI Osmo – perfect from a moving boat… but not very waterproof! The best edit suite in the world? We edit a couple of short features for the BBC News website with a unique view over Antarctica. I then use a combination of a BGAN (portable satellite dish) and the ship’s internet connection to beam the pieces back to London. They are due on air before we get back to Argentina so success is vital. Not all goes well though. I have some trouble successfully pointing the BGAN dish for a couple of reasons. One, the satellite I’m looking for is at only 8 degrees from the horizon, meaning any small hill (or glacier) can get in the way, Second, the anchored ship is constantly rotating very slowly, meaning the satellite position is changing. It’s tricky. I’ve read stories about a SKY news crew realigning the BGAN dish from the back of a moving truck as it steamed into Benghazi during the Libyan uprising. God knows how they managed to get that live signal out. I have some success but I eventually give up on my slowly moving cruise ship after an hour or so and head in out of the cold. On the journey out from Buenos Aires to Ushuaia on the southernmost tip of Argentina, Vic and I had watched ITV’s two part drama ‘Shackleton’. It’s a Sir Kenneth Branagh special, full of grandiose lines which we spent the entire trip shouting at each other. “Take only what you need to survive!” is uttered pretty much every time we head out of the kit room to board a zodiac. Trouble is, this trip is a world away from the hardships suffered by those early Antarctic pioneers like Shackleton. We often wonder what he would make of all this tourism malarkey; wealthy American retirees sipping brandy in cocktail lounges a few hundred yards from where the icy continent once applied its terrible regime of wind and snow upon weary explorers. In fact, unbeknown to us at the time, a British explorer, Henry Worsley, lay exhausted in his tent, unable to continue his solo quest to cross the continent. He would later die in hospital in Chile. He was 30 miles from achieving his goal and becoming the first man to do so. That is the terrible reality of this place. But the weather is kind to us, and so nothing is really that hard on this trip. I’d like to pretend it is, to make this whole experience sound more intrepid, but to be honest, the most daring feat of the entire trip is what we embark on today. We are jumping in the ocean. The water is 0.1 degrees centigrade, and there is ice floating all around us. Vic goes first (for the telly) and dives in like a pro! It’s a proper dive too, feet tucked together, barely a splash. It makes a great sequence for our film but she’s set a high bar and I’m now being egged on by the expedition staff to put the camera down and go get my swimmies. I reluctantly agree. After queuing (yes, queuing) behind around 60 eager tourists who clearly aren’t put off by the shrieks ahead of them, it’s my turn. My internal justification is that I have to film another point-of-view angle of Vic’s elegant dive to cut into our sequence. GoPro strapped to my back, I dive off the zodiac gangway and into a freezing pit of needles. My arms and legs immediately seize making me thankful for the leash which the expedition crew have attached around my waist. Slowly the feeling comes and and I have a brief swim before clambering back out. A towel has never been so inviting. We are heading home. It’s hard to bear but we have work to do so we can’t dwell on the wall of ice disappearing away from the bow of the ship. 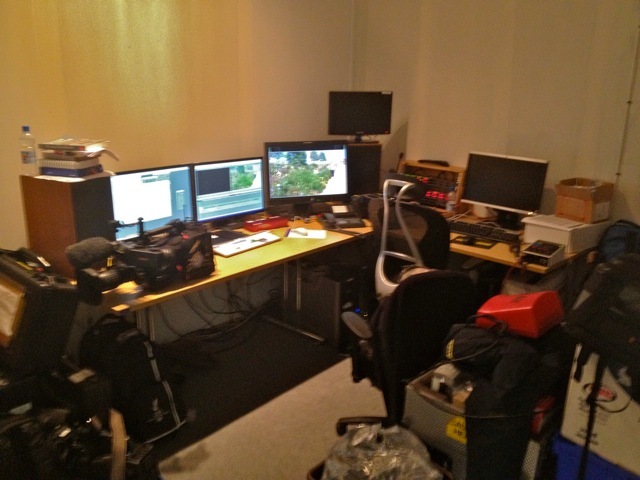 The edit suite is set back up and we cut our package for the BBC News at Ten. The cabin doubles as a voice over booth complete with state of the art sound proofing. More short film edits follow, but as we enter open sea past the South Shetland Islands, my ability to stare at a laptop screen diminishes, and I’m soon taking it easy. Vic on the other hand just cracks on. That’s my girl! She has a number of radio pieces to produce so she gets on with that. I occasionally surface to play piano in the lounge (did I mention the ship has a grand piano? No?) which actually helps a lot. I think it must be down to the fixed horizon of the keyboard. I offer the odd word of encouragement and advice but I’m mostly useless. Hold it together Cheeseman! I think I’m over it! I have my sea legs. It’s wonderful. I can work. We get to work editing a short film which will be shown at the ‘end of expedition’ presentation later. It’s the least we can do for the crew who have been fantastic to us. They’ve been really helpful and accommodating to all of our unreasonable ‘media people’ requests. Out comes the music library, and it’s a great fun to look through our pictures and cut a piece together. 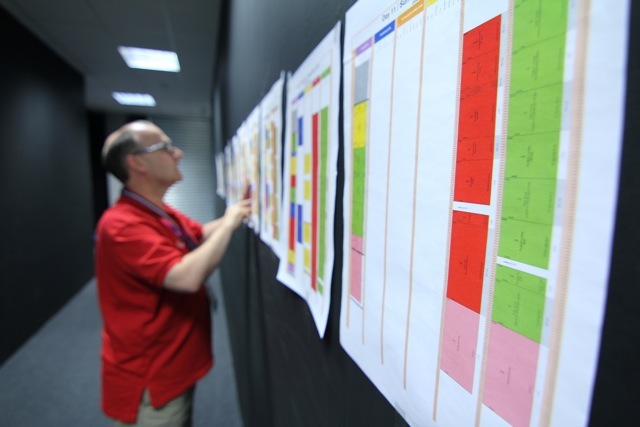 It also helps us plan the rest of our output which we will be putting together in Buenos Aires once we return there in a couple of days. In the evening, Vic does a little presentation to the tourists whilst I sit at the back of the room. I love moments like this when you see your work displayed in front of an audience. I spend my time watching the people whilst they watch the film, looking for reactions, moments of boredom or engagement. It really helps cement in my mind some of the sequences that will be in the final documentary. But as Vic says later, mostly people just like the parts with either themselves in… or fluffy animals. Before we know it, the shore of Tierra Del Fuego comes into view and we know it’s over. Gutted. So that’s it. Probably the best trip I’ll ever do with my job? I can’t think of many places that would top it… The moon? It’s right up there. Here are some links to the films we made. I’d not planned on coming to Russia. 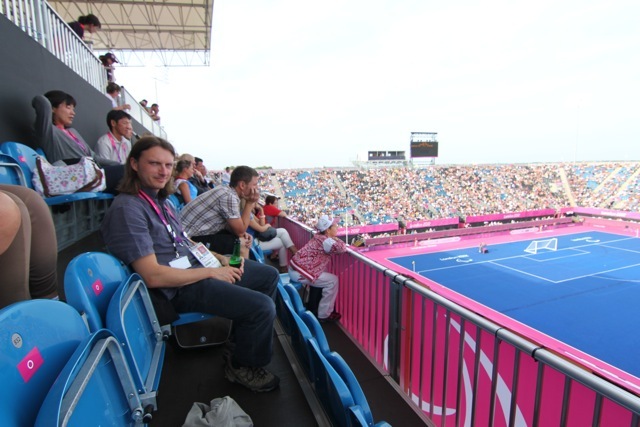 The BBC Sport Olympic operation was small and typically impenetrable, and after my experiences with the International Paralympic Committee’s ParalympicSportTV at London 2012, I valued my health too much to commit to another understaffed project. However, when the IPC approached me and I saw that there were actually plans (!) and [drum roll] rough technical drawings, I reconsidered. As with any ambitious project, good planning leads to success, and thankfully lessons had been learned from the stresses of London. 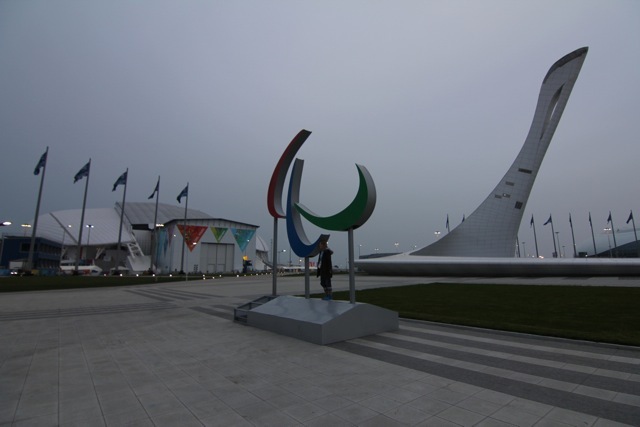 So my plane ticket on Aeroflot was booked, and this time around I would be part of the Paralympic Family, staying in a hotel inside the Olympic Park with the rest of the team. On arrival, the scale of the park was impressive. It was almost on a par with London, which given the money the Russians had spent on it, was expected. 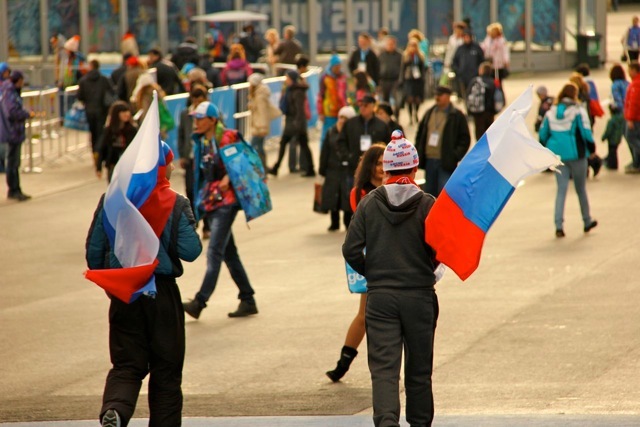 The Russian organising committee were still in the midst of the transition from Olympics to Paralympics, much to the concern of the IPC branding police. Every single Olympic Rings logo has to be replaced with an Agitos (the Paralympic Games emblem). This includes branding on the jackets of the thousands of volunteers, flags, signposts, the lot. 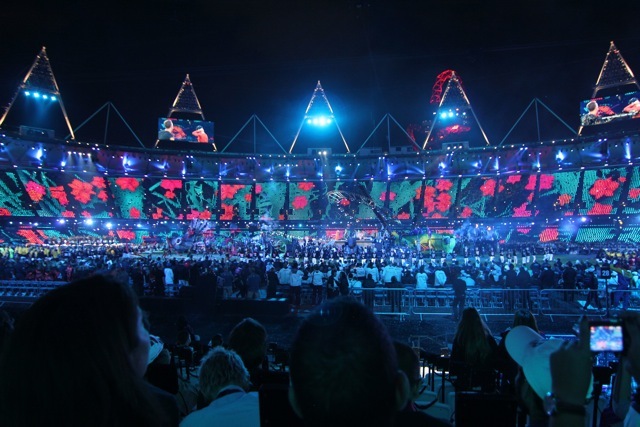 In London, LOCOG had been very impressive at making this happen… it was a little bit more relaxed in Sochi, but on the day of the opening ceremony they had pretty much done it. 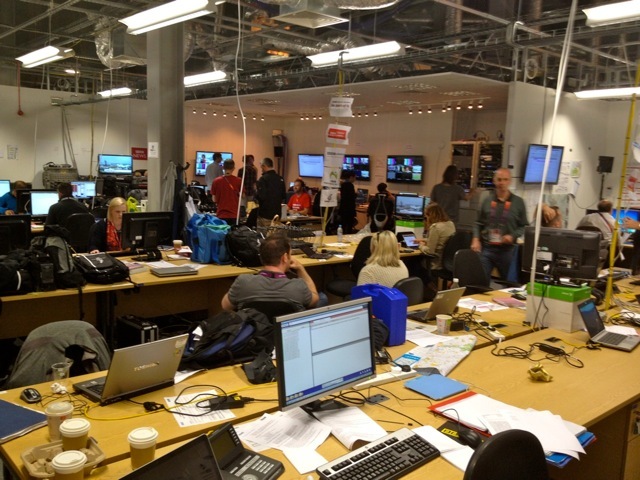 On the list of impressive buildings on the site was the Media Centre, which housed the Main Press Centre and the International Broadcast Centre, where our operation would be housed. The mountains, where most of the sport would take place, loomed in the background, and the coastal park venues (including the Fisht stadium) were a few hundred yards away. 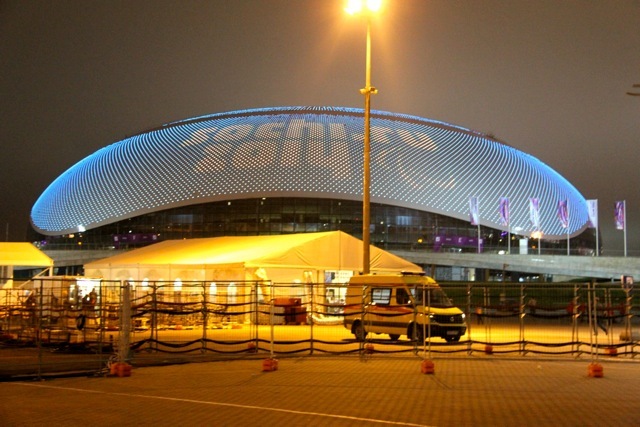 The stadium was magnificent – shaped like the body of a whale with the Olympic/Paralympic cauldron doubling as the tail. The Fisht stadium and Paralympic cauldron in the run up to the Games. 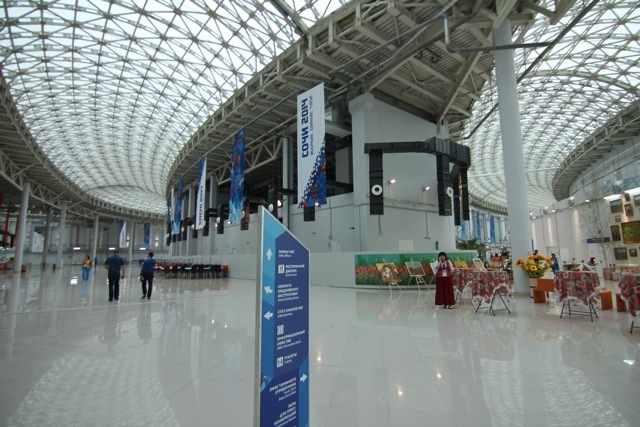 Inside the IBC – complete with traditional Russian cafe! The main difference for me at these games was the fact that I had arrived 5 days before the opening ceremony. In Vancouver in 2010 I was booked from the day before the opening, and in London only 2 days before, so I have always walked into a half-built, panic-stricken office. This time it was an empty office and everything needed to be built from the three pallets of equipment which had been delivered from Germany, but at least we had the time to do it. 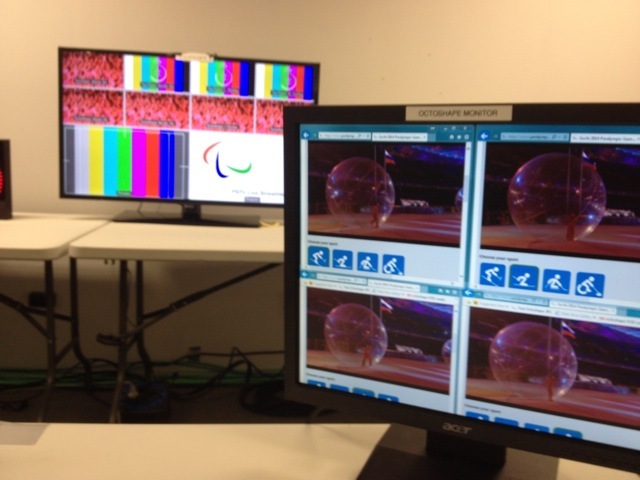 The basic idea of the operation was to take 10 video signals which held a mix of the Winter Paralympic sports coverage from the host broadcaster, OBS (Olympic Broadcast Service). These signals would then be manually routed onto 4 channels, one for Alpine Skiing, one for Nordic Skiing, one for Ice Sledge Hockey and one for Wheelchair Curling. We would then stream these 4 channels to a multi-view online player which was embedded in the IPC’s own website, and onto youtube.com using their live events service. This youtube service could then be picked up by various outlets around the world who had made deals with the IPC to stream live Paralympic sport throughout the games. Simple! 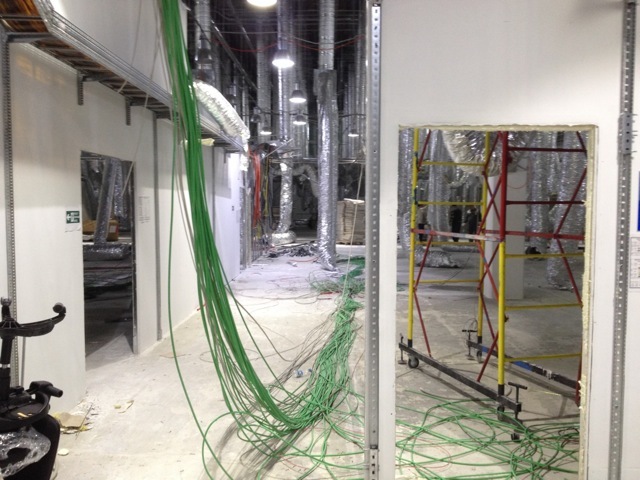 …10 wires hanging from the ceiling from which we would receive live sport! But all would not go smoothly. 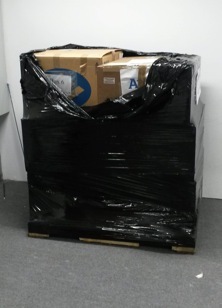 After unpacking the crates on the first day, we arrived the next morning to discover that thieves had entered our office during the night and taken some equipment. Laptops, speakers, keyboards, post it notes (!) and most importantly, the Senseo coffee machine had vanished. We contacted the Russian police, and various men in black leather jackets descended on the office and began standing with their hands on their hips pointing at things. Remember that an Olympic Park is probably one of the most secure places on earth. Everyone who enters or exits has to have official accreditation and pass through airport-style security. Couple that with the fact that the IBC was swarming with CCTV, and you can see why the Russians were confident of catching the perpetrators. Things were not about to move quickly though, so we gathered the kit we still had, and began building the TV station. Three days later we were finished. 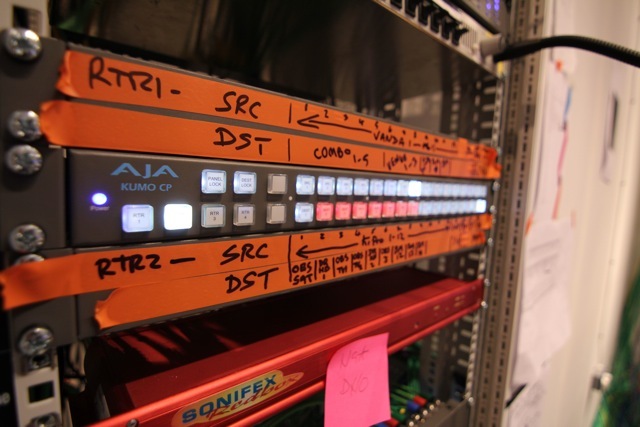 4 channels with multi-viewers, 2 edit suites, a record bank, an archive server, 5 live broadcast streaming machines and a master control room. All we needed was some laptops to operate it all. The latest from the Russian Police was that they had identified the people responsible, and they had them in custody. Apparently they had been spotted running through the corridors of the IBC carrying a Senseo coffee machine! The good news continued when we found that the equipment was still in the building. But no one knew where. 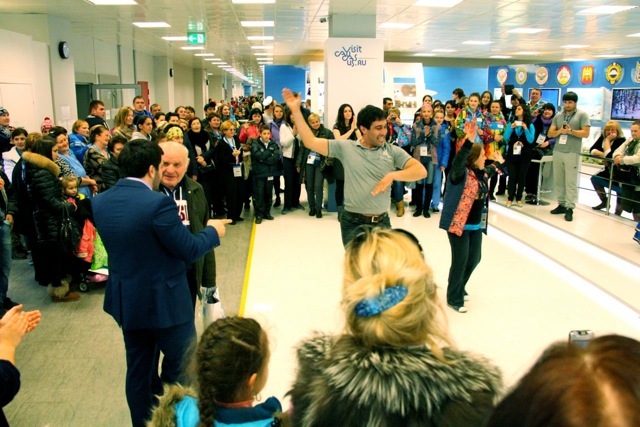 As the opening ceremony approached, we carried out testing and training with the volunteers and IPC staff who were arriving in Sochi. This was unheard of in London. We barely had time to figure out the workflow ourselves, never mind train others to operate it. 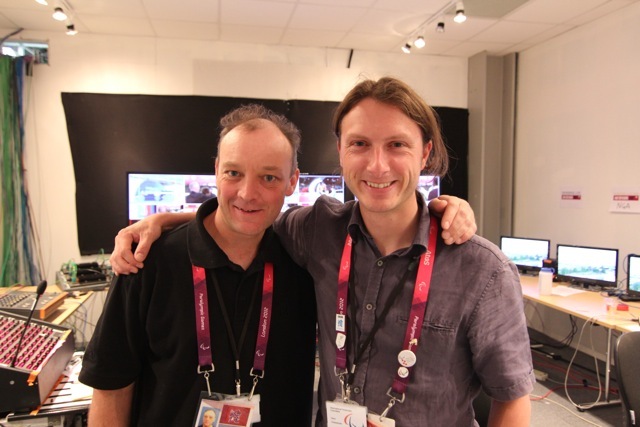 I distinctly remember it being day 4 of the 2012 games when I first had time off whilst the channel was on air, meaning that was the first time I had successfully conveyed the operation of the station to someone else. 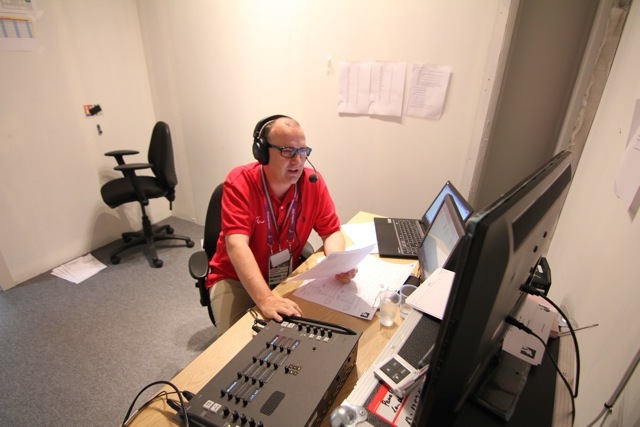 With testing successful (barring some minor tech problems, like ALL of the sound mixers dying) we were ready to broadcast the Sochi 2014 Paralympic Winter Games. 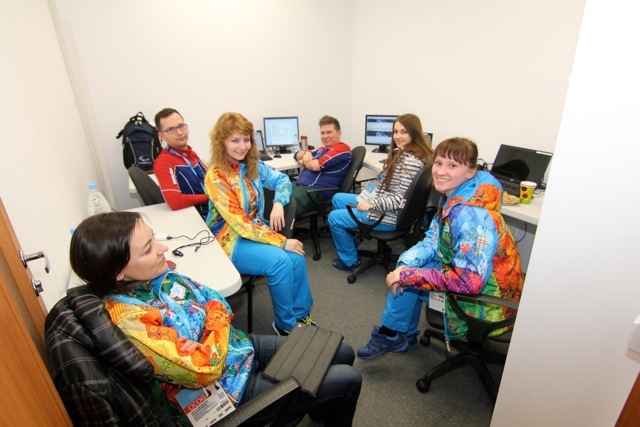 The official IPC Sochi 2014 sound mixer graveyard – managed to get by, by using a commentary box to monitor the channels! As the Games progressed, everything went to plan. The viewing figures were good and the IPC website was experiencing record traffic for a Winter Games. Things were looking good for my home country too. Having secured a silver on the first day, Team GB went one better when Kelly Gallagher and her guide Charlotte Evans won the women’s visually impaired Super-G on day 3. It was Britain’s first ever Winter Paralympic gold medal and so I decided to take the evening off to head up to the mountains and watch the medal ceremony. 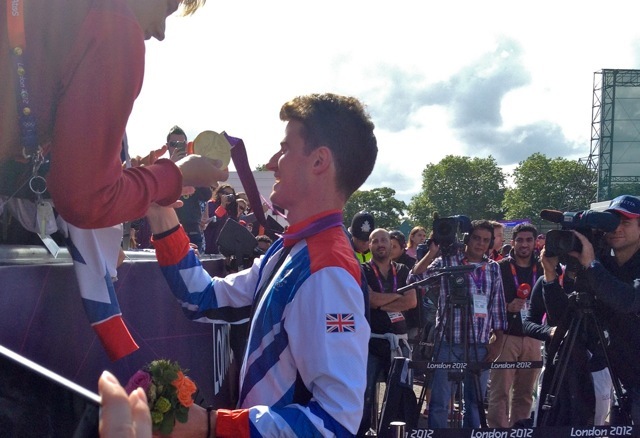 Being part of the Paralympic family has its perks. You are able to take ‘T3′ transport around the Paralympic venues, and this means basically flagging a free taxi anywhere you want to go, although the taxis are all sponsors’ vehicles (Volkswagen Passats in this case!) The drivers are employees or volunteers, and all have a wide choice of Russian radio stations to entertain you with on the journey. My favourite was a trip around to the IBC, where the driver listened to a Metallica ‘medley’ with all the vocal sections stripped out. It was just riffs and guitar solos! I want radio stations like that in the UK. So I took a ‘T3’ on the 45 minute ride up to Rosa Khutor alpine resport. On the way up you get an idea of where some of the vast sum of money ($51bn) the Russians had spent on these games went. Brand new road and rail lines carve up, and through, the mountains on the way to the alpine. Miles and miles of brand new infrastructure leads to a brand new mountain resort. 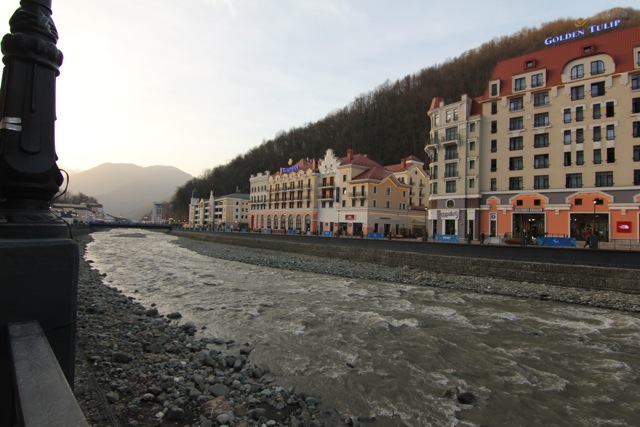 Krasnaya Polyana, where the Rosa Khutor station is based, is not some sleepy mountain village either. There are vast new multi story hotels along the banked Mzymta river and several ski lifts soaring out of the valley up to the ski areas. Right in the centre of the resort is the medals plaza, and that is where I headed to see an historical moment for Paralympics GB. On reaching the plaza, the AAA pass really came into its own as I was ushered into the athletes’ compound right in front of the stage. There were loads of the GB team in there and the atmosphere was brilliant. 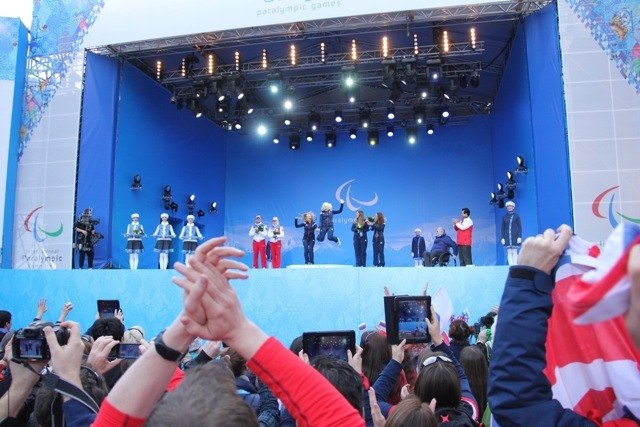 Sir Phillip Craven, the president of the IPC, was on stage and, despite his obvious need to remain impartial, you could tell he was loving presenting Great Britain’s first ever Winter Paralympic gold medals. 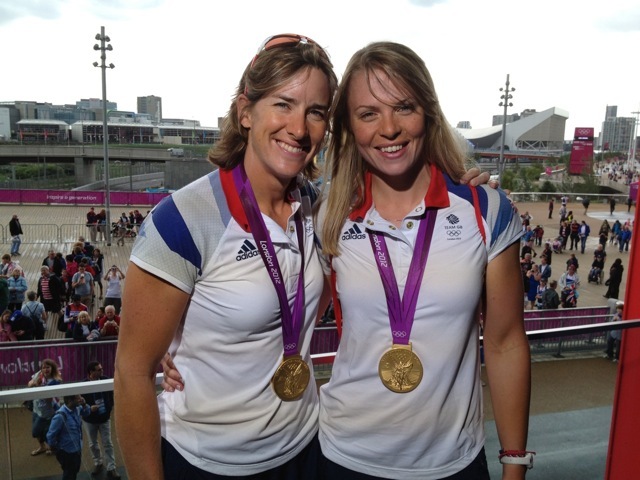 Kelly’s celebration was great, and it was brilliant to see Jade Etherington and Caroline Powell get bronze. 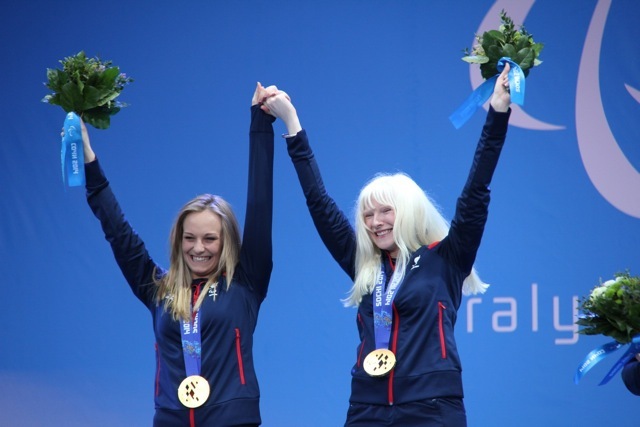 It was their 2nd medal of the games at that stage, they were on their way to the 4 that would make them the most successful female British Paralympians of all time. My view from the athletes’ enclosure in the medals plaza. Jade Etherington and Catherine Powell on the right step for Bronze, Kelly Gallagher in mid leap! After the celebrations I met up with a couple of guys from the office to go for food. 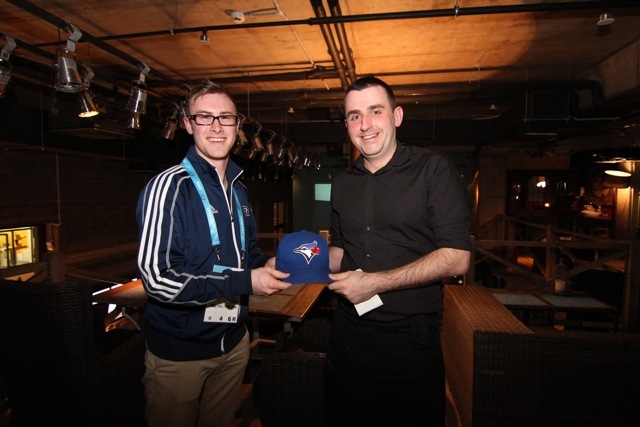 One was Ryan, a writer from Canada who was wearing a Toronto Blue Jays baseball cap. We sat down in a pizza place which was packed with coaches and staff from Paralympics GB, and ate a pretty good meal by Russian standards. When we asked for the bill, the waiter approached us and asked Ryan if he could buy his hat from him. After a bit of haggling a deal was made for 1700 Roubles (nearly $50CAD…. he really wanted that hat) and we retired back down from the mountains to our hotel. A surreal end to a great night out. Back on the coast, Paralympic Sport TV was running nicely and so I took the opportunity to go to an Ice Sledge hockey game, Russia vs Italy, at the Shaybar arena in the Olympic Park. A couple of days prior to this , President Putin had attended the Russia vs Korea match. When he turned up the Russian team were 2-0 up, but he sat and watched them concede 2 goals to take it to overtime and penalties, which they lost. The Shaybar was quite a compact arena, and the Paralympic family lounge, to which I had access with my AAA pass, was only the size of your average hotel lobby. Putin had been swept into the stadium via this lounge, and virtually taken it over with his entourage and security. One of my colleagues counted 31 cars outside the entrance! When he arrived in the arena, like with so many other appearances at the Games, he was greeted with a standing ovation. The Russian people really do seem to love him. Can you imagine David Cameron getting a standing ovation as he walked to his seat at the FA Cup final? No! 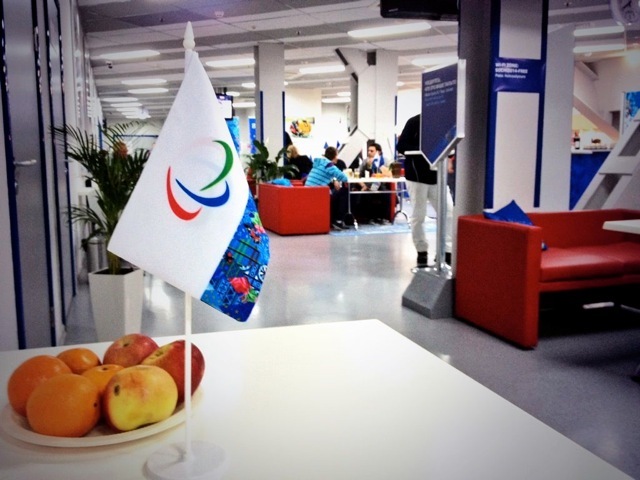 The Paralympic Family lounge at the Shaybar Arena – free everything! I settled down to watch the game and the atmosphere was brilliant. If I had to recommend any Paralympic sport, Winter or Summer, then Ice Sledge Hockey would be high on the list. The pace the teams display is amazing considering everything they do is propelled through their upper body. And they hit each other… hard! After the disappointing display in the last game in front of the great leader, the Russians were not going to lose this one. 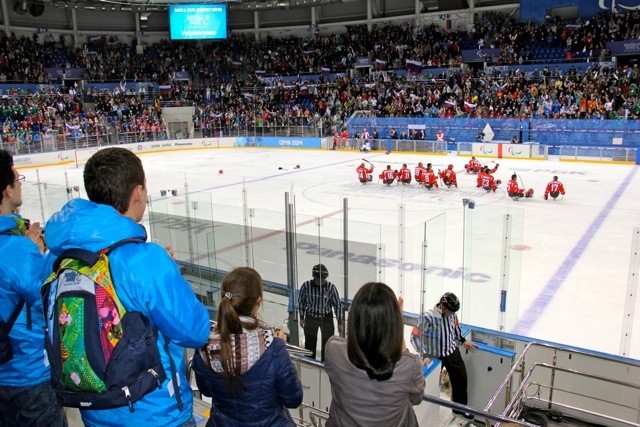 They eventually won it 7-0, which was greeted with huge noise from the Russian fans. They went on to reach the final and take the silver medal despite only forming the team a few years before Sochi 2014 – not bad for their first ever Paralympics! Wandering around the Olympic Park the next day, I managed to get a feel for how much the Russians loved having the games in their country. Kids of course loved the facilities and the activities in the park, as well as the sport. 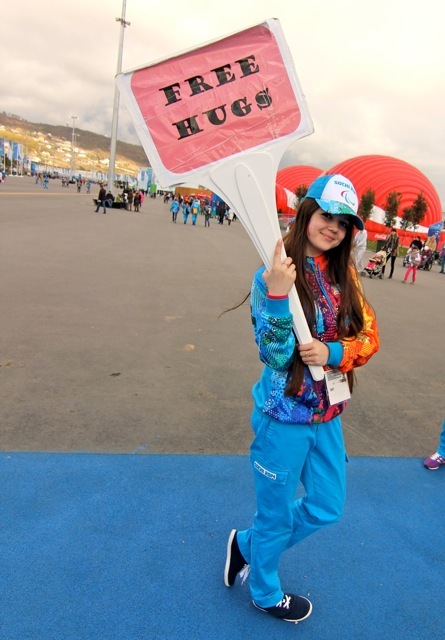 Much like London 2012, the Sochi volunteers and staff were friendly and welcoming and the atmosphere in the park was great. So much effort goes into making the Games happen that the spectacle of the event is always special. 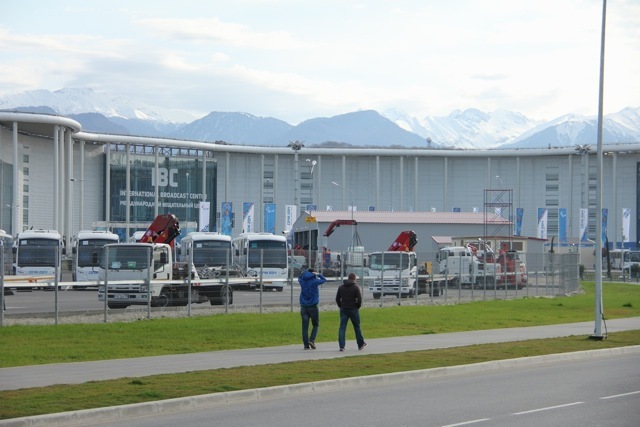 I managed to get across to the exhibition centre to take a look at the Russian regional exhibitions which display the best of each of the vast Russian regions, including Krasnodar, the area in which Sochi is located. The highlight was definitely a spontaneous Russian dance off between young chap and an old woman in the Caucasus section! Some of the Russian (and Polish!) volunteers who were clipping up Video on Demand for the IPC youtube channel. They were great fun and did a fantastic job. Apart from English, the one thing everyone has in common is the excitement of being at a Paralympic Games. Everyone comes into work with a spring in their step. It is the sport, the entertainment, the drama of the Games which I’ve always found to win over even the most unwilling staff. Broadcasting sport involves watching it of course, and you could not watch the Sochi Games without getting caught up in the excitement. Whether it was the record Russian medal haul, the incredible recovery win by Canada’s Brian McKeever in the Cross Country sprint, or the brilliant Ice Sledge Hockey tournament, the fact that you get to be part of such an amazing event makes this one of the best jobs I could ever think of doing. And I can’t wait for the next one! In the heady days of Tim Henman reaching the semi-finals of Wimbledon a few years back, it seemed unthinkable that a Brit would actually win it. But here we are in 2013 with a mortal from this great nation holding aloft the men’s singles trophy as we laugh in the face of adversity. 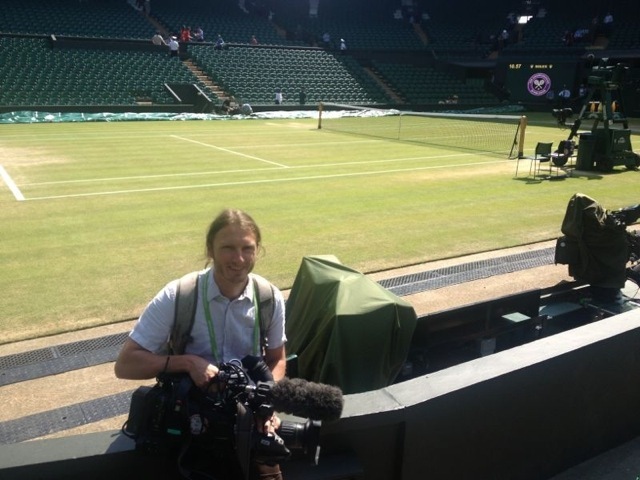 Having worked at the All England club as a shoot edit cameraman for BBC Nations & Regions for the past 3 years, I’ve been lucky enough to see two great years of British tennis success. Last year we had a doubles champion in Johnny Marray, this year the big one. It has been amazing to be part of. 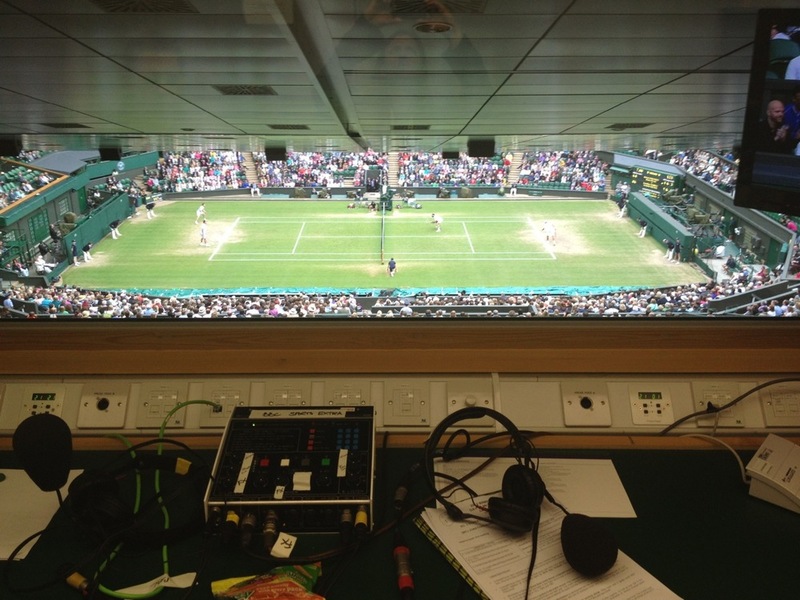 As I sneaked into centre court commentary box to watch part of the 2nd set of the final, it felt like everything was falling into place for Murray. And it did. The week had started with plenty of British disappointment though. My job was to cover any British interest for the various regional news bulletins across England, and the national news for Scotland, Wales and Northern Ireland. Week two of Wimbledon is where the juniors start, and I spent the day frantically running between courts, grabbing snippets of action and then interviewing mostly downbeat youngsters whose Wimbledon dreams had ended in the first round. As the week progressed though, some glimmers of light shone though. Kyle Edmund, who hails from my region of East Yorkshire was doing particularly well in the boys’ singles. The excitable Hull-based reporter Simon Clark had decamped to SW19 to tell the story of “Tickton’s finest” (Kyle’s home village in East Yorks). Laura Robson won through to the 4th round of the women’s singles, and a young lad from the Isle of Man called Billy Harris had had the honour of winning the island’s first ever match at Wimbledon. The usual smattering of celebrities were appearing on the broadcast roof to feature on various TV channels. 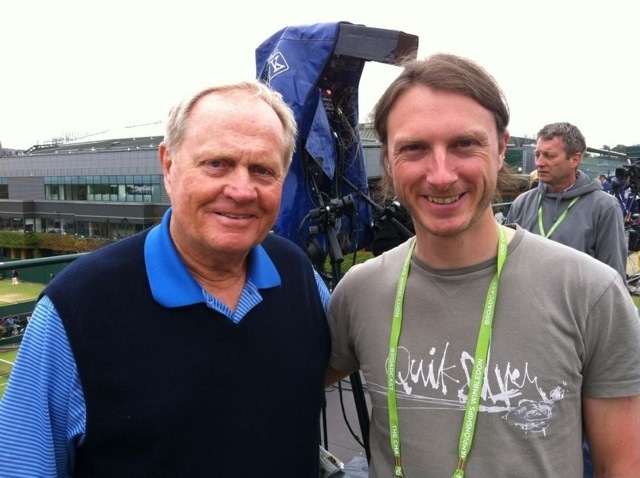 I caught glimpses of Bear Grylls, Jude Law, Amir Khan and golfer Jack Nicklaus, who was amenable enough to allow me to have my picture taken with him. 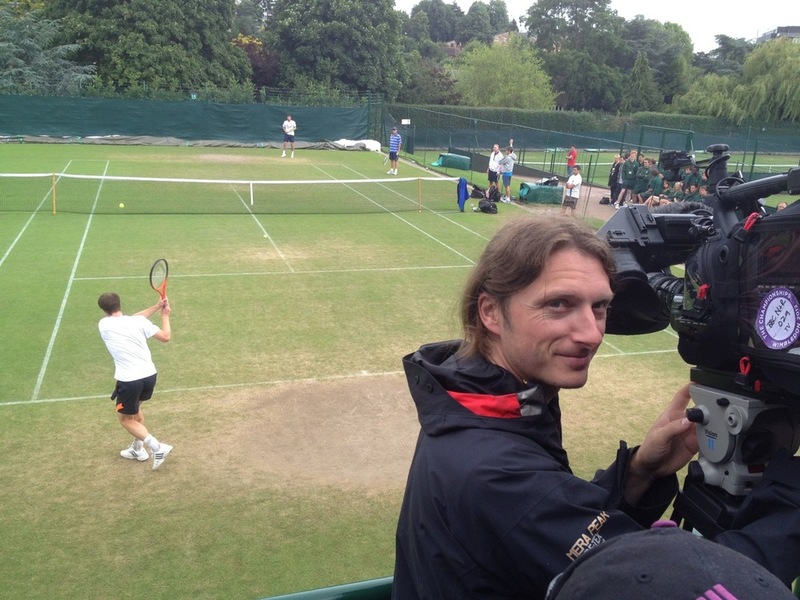 Occasionally i would nip over to the training courts to film the top players practicing. It is always a thrill to see how amazing they are close up. Below are videos of Andy Murray serving and women’s singles champion Marion Bartoli doing a brutal back hand exercise. After I saw that, she was my tip for the win!! Marion Bartoli training at Wimbledon from David Cheeseman on Vimeo. 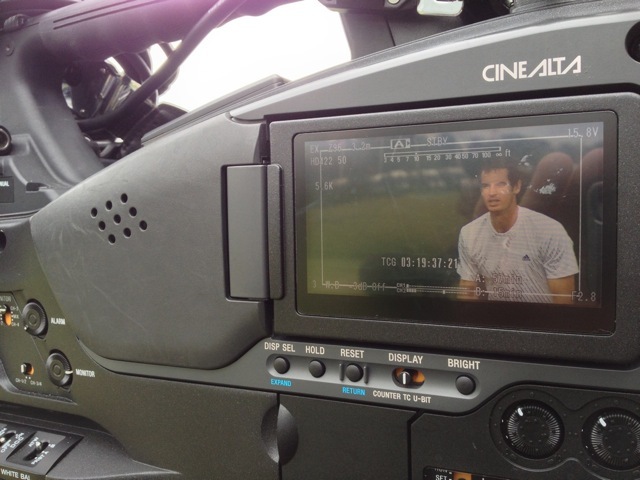 Andy Murray serving on Wimbledon practice courts from David Cheeseman on Vimeo. The big story though came at the end of the week. BBC Scotland reporter David McDaid follows Andy Murray around the world to let the nation know how Dunblane’s most famous son is getting on. 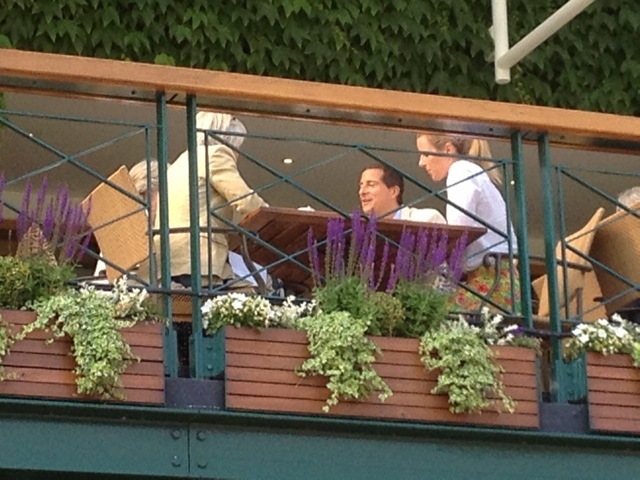 As he went 2 sets to 0 down to Verdasco in the quarters, heads were in hands right across the office, including David. But as we’ve seen almost every year, Murray fought back to get through. I still didn’t think he would ever get past Djokovic in the final. 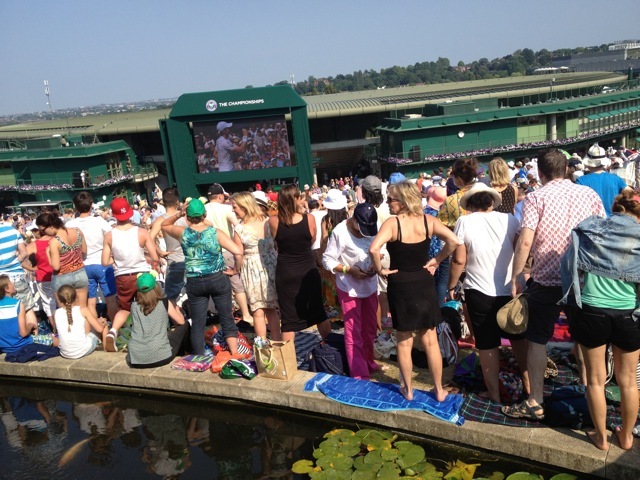 For match point I was filming to faces of the crowd on Henman Hill. The last game was excruciating, but the celebrations were brilliant. Only later that evening did I get to actually watch the tennis. To get through that game was outstanding from Murray – hats off to him. After the game I edited and filed a package for BBC Reporting Scotland before being summoned down to the interview rooms to chat to Andy himself. He was very humble as usual but gave some great comments about Scottish pride and his hope to come back to visit soon. I’m sure he will be more than welcome up there. 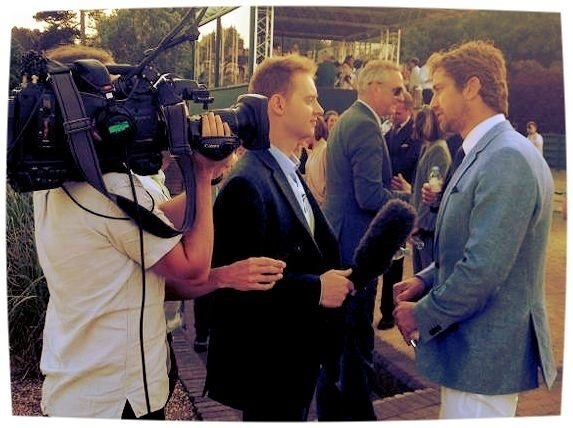 To top off a surreal day, we managed to secure a brilliant interview with the actor Gerard Butler. 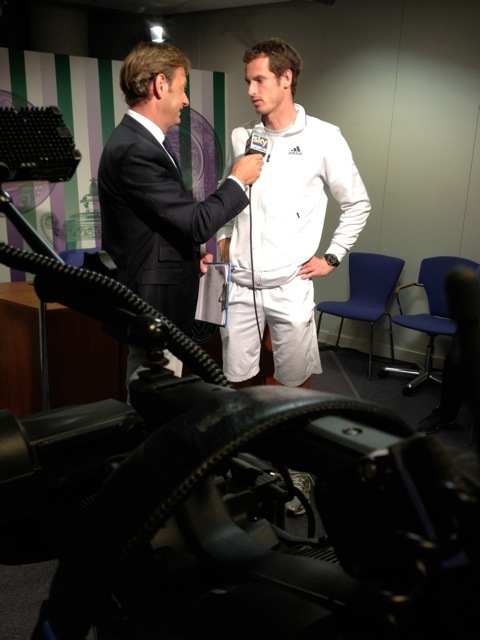 He was great value and was thrilled with Murray bringing the Wimbledon title to Scotland. Here’s hoping for many more wins in the coming years. 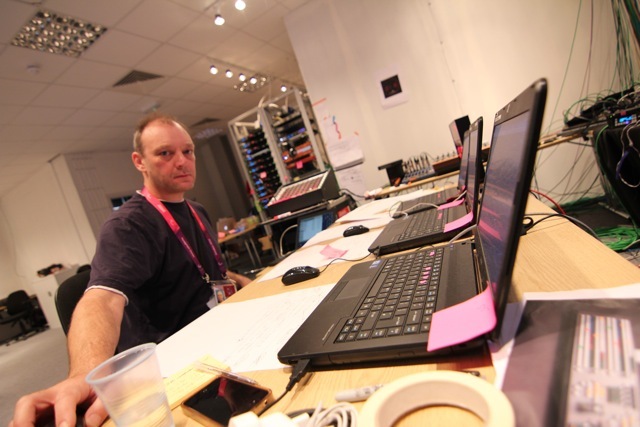 Sometimes you wish you hadn’t accepted a job, and four days into my Paralympic experience at London 2012 I was on the verge of thinking just that. 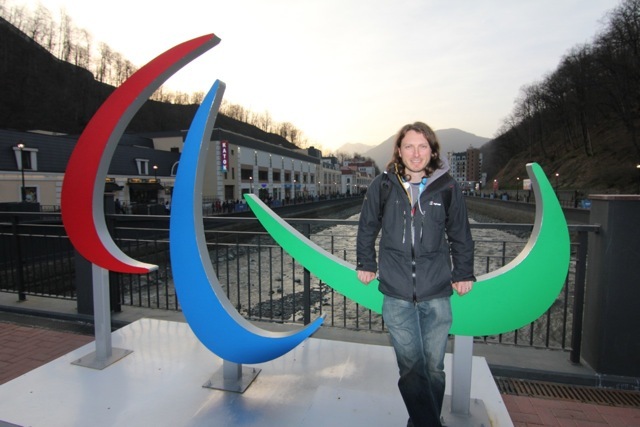 I was working for the International Paralympic Committee on a project called ‘paralympicsport.tv’. Put simply, it’s a TV station which endeavours to air as much Paralympic competition as possible, to as many people as possible during the games. As you know, the Paralympics are the ‘Parallel Olympics’, they are supposed to be equal and run alongside the Olympics, but in broadcasting terms, the Olympics reaches a much bigger audience than the Paralympics (the media presence in the International Broadcast Centre for the Paralympics was a quarter of the size). This was mainly due to decisions made by global broadcasters not to fill their schedules with Paralympic Sport. 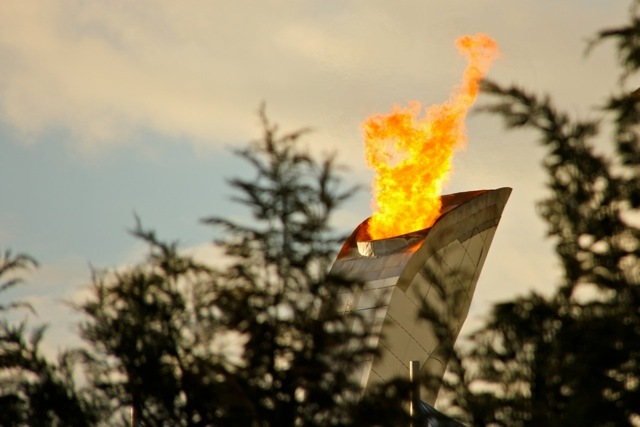 All of the sports are still filmed by the Olympic Broadcasting Service, but rarely are they shown to the people across the world who want to see it. That was where this project came in. 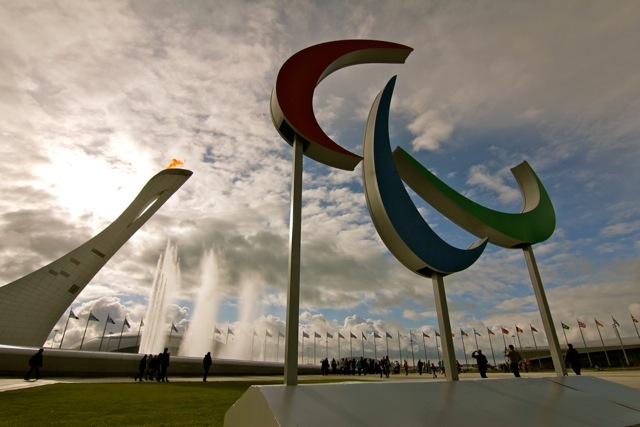 By simply going to the IPC’s official website (paralympic.org), anyone across the globe could watch top class live and recorded Paralympic events. I’d been involved in Vancouver in 2010 at the Winter Paralympics where there are four concurrently running competitions at any one time. That had been busy enough! In London there were up to 11 sports being filmed by the OBS which we were going to attempt to broadcast to the world on 7 channels. I arrived two days before the opening ceremony having had a relaxing break in Sweden. It didn’t take me long to realise there was a lot of work to do. Jochen and John building the gallery and other things. 1 day to go! Sound simple? Yes! But there were complications. One of the channels needed to be simulcast in Spanish, and a deal had been struck to send this same channel to international TV broadcasters such as Al-Jazeera and Super Sport South Africa. Technically, there was an issue that the recording and play-out were to come from the AJA Kipro, a sort of tape machine with hard drives instead of tapes. It works just like a tape in that you can’t play out a recording until it has finished. Not perfect for running time-delayed sport on a 24 hour channel but we had what we had. But the biggest issue was that there were only 4 technical staff available to run everything, and the channels ran 9am until midnight. Not good. Luckily I had drafted in an old friend, John Greatwood, who is a tech wizard and managed to make my band Pillow Talk sound pretty good a few years ago. He can do anything! We set about finishing the construction of the gallery, record bank, edit suites and commentary booths. …and the AJA Kumo matrix for routing all the various signals to various places. We should have bought a bigger matrix! … somehow we were on air though, but sleep was a luxury. By this time, the AJA Kipros were recording hundreds of hours of commentated sport, and this was being transferred manually to a Facilis server for archive. We were vision mixing between events and cueing commentators (including in Spanish) to pick up. We were running edited news packages featuring highlights of the days action. 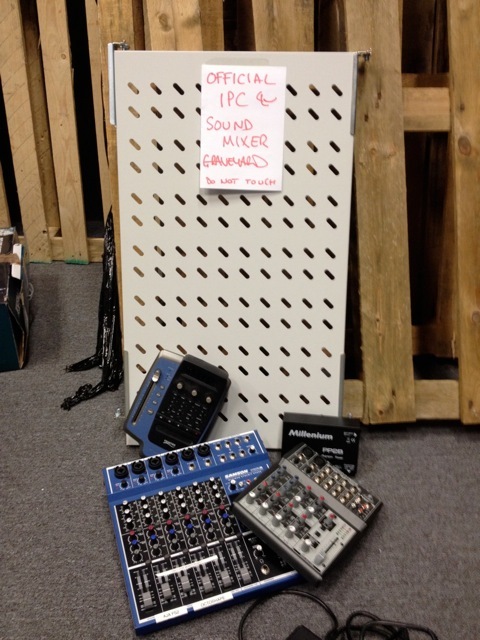 All with just 5 technical staff (the IPC had shipped one more in to help). The schedule was quite complicated, with some events running live and some running time delayed or ‘relive’. This added to the complexity of the event and required us to cue up play-outs whilst simultaneously recording other feeds, vision mixing channels and cueing commentators. And that’s if it ran smoothly and on time! I did a staff list on day 5 to ascertain the minimum number of people we would need to make the operation run smoothly and counted it as nearly 50. There were 15 of us! John Greatwoodvision mixing 3 of the channels at once. Legend. The very talented and flexible commentary team, (L-R, back) Amy Bainbridge, David Oates, Francis Collings, Nick Gillingham (front) Nigel Adderley and Jeremy Nicholas. They tried their hand at most sports. All said though, what the IPC managed to pull off was staggering. With such a small budget they managed to air hundreds of hours of sport which would have been unseen to anyone outside the venues, with commentary, to the world. They broke all records on website attendance and London 2012 turned out to be a real turning point in how the world sees Paralympic Sport. A huge success. I was glad to be part of it. On the last day I thought it fitting that I should go and watch some sport. So I went along with Jeremy, one of the PSTV commentators, to see Ukraine vs Russia in the 7-a-side final. 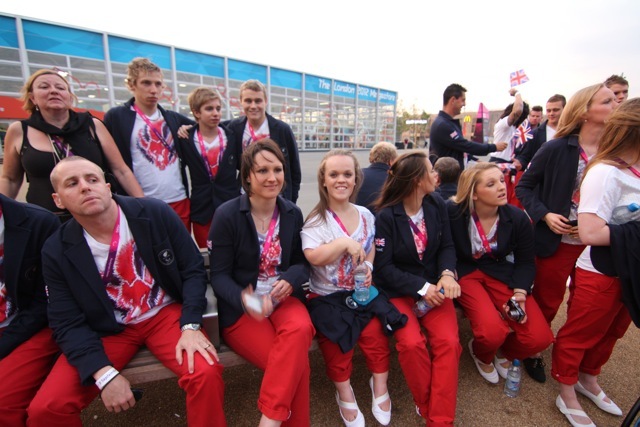 As part of the IPC team you get to sit in the Paralympic Family seating which is the creme de la creme! Earlier in the week I’d gone over to the stadium after a very long shift to grab some food and watch the final athletics race of the day. I stood at the buffet next to Ed Milliband, saw countless other politicians and also Seb Coe and Princess Anne relaxing in the same lounge as me. Very surreal. 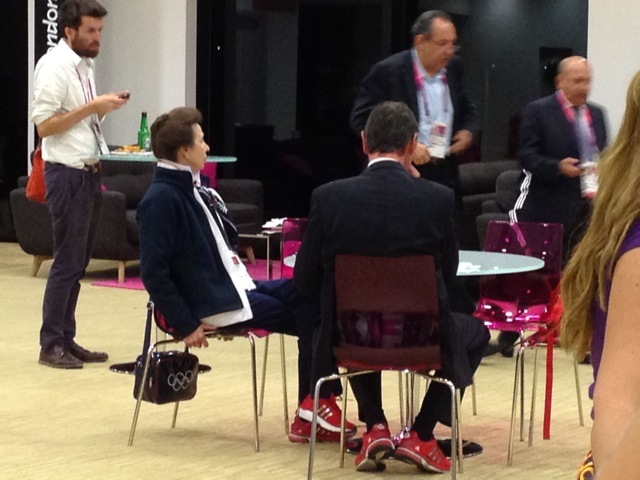 Princess Anne hanging out in the Paralympic Family lounge. Love the TeamGB sneakers and Olympic handbag! Best place to watch the athletics. Am a bit scruffy for the royal box though. Enjoying a beer in the Paralympic Family stand at the Riverside Arena. Well earned. Before it was all over, I still had time to edit a film which was to be screened at the closing ceremony, the Whang Youn Dai award. After a couple of celebratory glasses of champagne we headed off to our Paralympic Family seats for the ceremony, watching all of the athletes march up to the stadium including some familiar faces and picking up some interestingly packaged dinner on the way in. It was a great show. Coldplay were pretty good, the lights were as amazing as they had been for the Olympics a few weeks earlier and it was a great feeling to hear 80,000 people cheer parts of my film when it was played on the giant screens in the stadium. 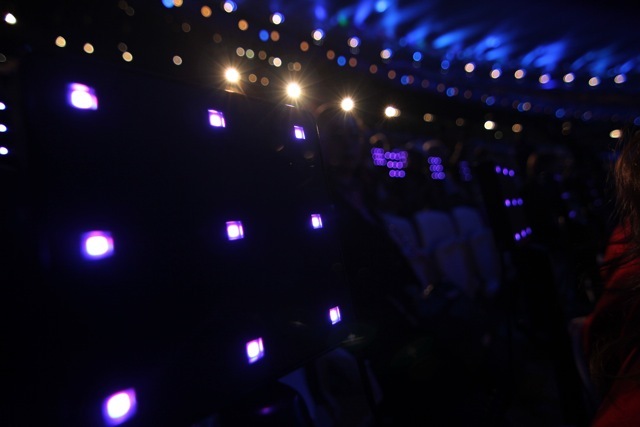 One of the LED matrix lights…awesome! The best thing though, as always, were the fireworks… I can still see them now. It was 3 days before the start of the Olympics. I arrived in London to incredible heat, the hottest day of the year. 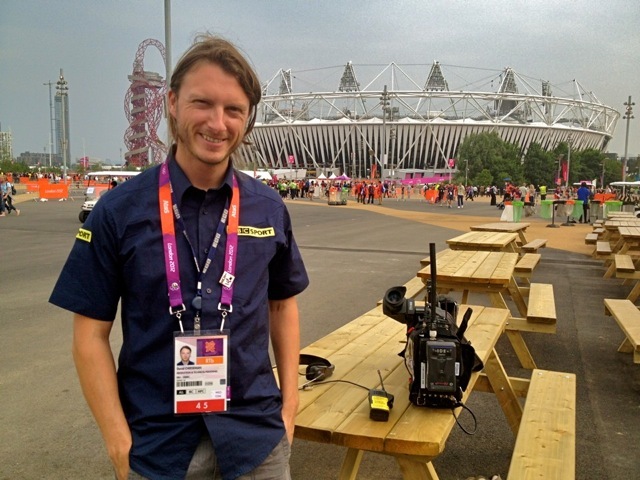 I had to carry my camera kit to the International Broadcast Centre in the Olympic Park. Not knowing the lie of the land, I thought I’d take a walk and do it by hand, on the tube. I set off with my trusty trolley from Shadwell, where the BBC had put all staff up in student digs. 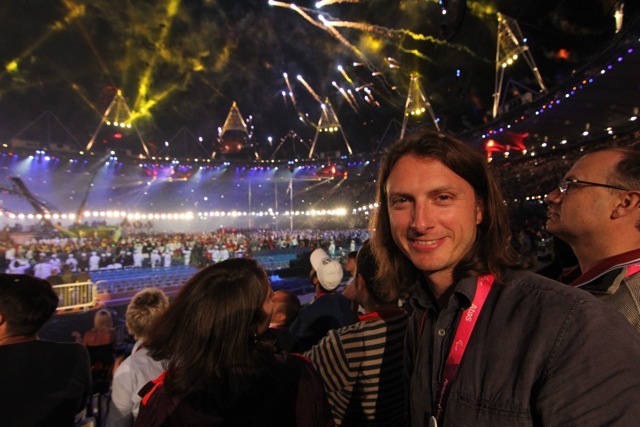 As you may know if you’ve kept tabs on this blog since I started writing it, I took time away from my BBC job in the UK back in 2010 specifically to work over in Vancouver at the last Winter games. I’ve got a slight obsession with major sporting events. 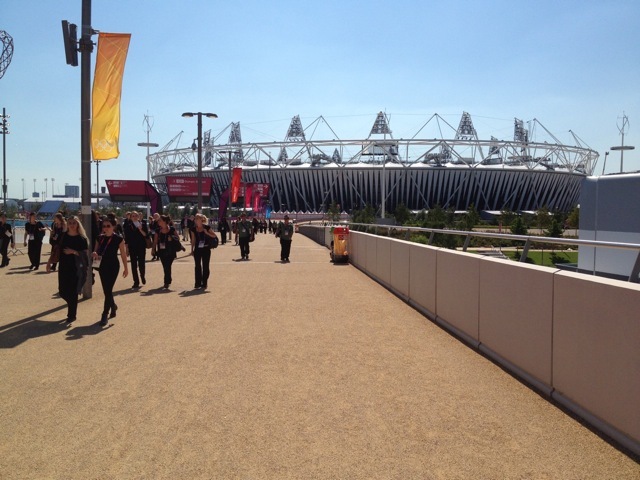 Walking into the London 2012 Olympic Park that day with my heavy trolley was quite special. What was just as special was that I’d be working for the BBC. The host broadcaster. 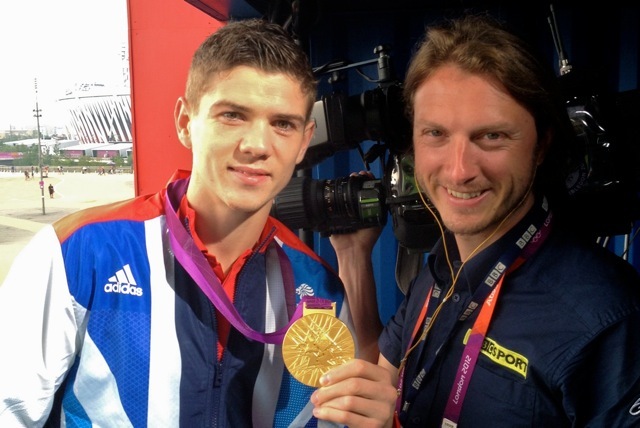 Number 1 in the list of broadcasters for London 2012. All those long hours, nights, missing out on my other passions, music and sport, seemed worth it to be here in this job. I finally reached the BBC offices and basked in the freezing air conditioning. The other members of our team were starting to assemble. We were there to serve BBC Nations & Regions, the parts of the BBC which offers local content whether you’re in Wales, Scotland, the North East, the South West, or East Yorkshire (!). My job was to film and edit specific material for all of the 12 English regions, along with my assigned reporter, Tanya Arnold from BBC Look North. I’d been interviewed for the job back in September after initially interviewing successfully for a job with the Olympic Broadcasting Service in early June. OBS are the company who film all of the sport, they work specifically for the International Olympic Committee at every games. 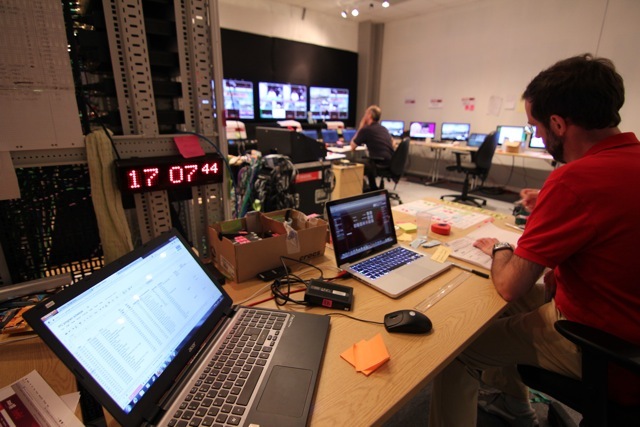 They provide a feed of every single piece of action to all of the broadcasters around the world, who then add commentary and analysis from their purpose-built studios and offices around the Olympic Park. That job sounded brilliant, but being part of the OBS team has its downsides. 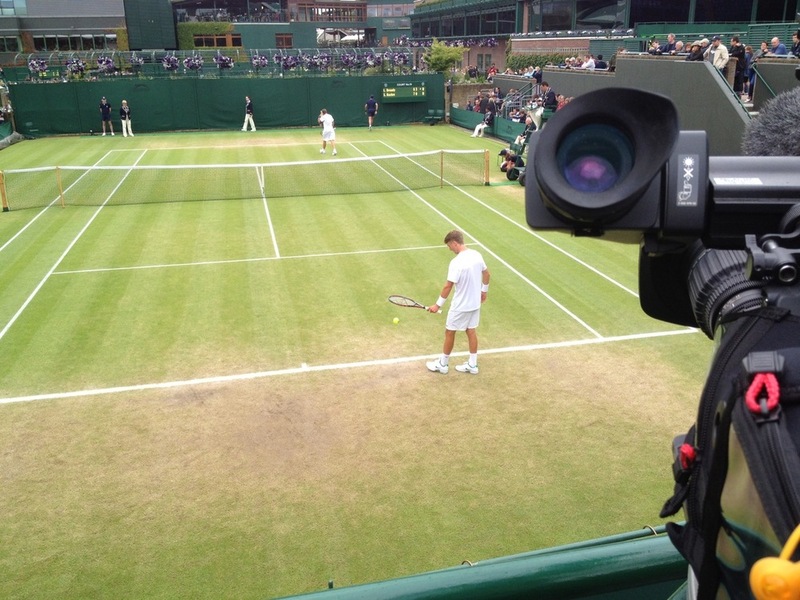 Because of the need to specialise in each sport, a camera operator may find themselves tied to one venue. If that’s athletics then quids in, but it may equally be Greco-Roman wrestling (no offence to all you wrestlers out there of course, but it’s not the focus of national interest in Britain). The other trouble I’d had was that accepting the job with OBS may have meant that I would need to leave the BBC, which was a big decision to make. So, I held on hoping that I may be allowed either to take up the OBS role on unpaid leave, or that something at the BBC would eventually come up. So when I managed to get the Nations & Regions job at the BBC it was a huge weight off my shoulders – I would be part of London 2012. And not just part, the job required me to flit between lots of different venues gathering material, rather than be fixed at one. My accreditation was ‘ALL’, the golden ticket. I could access every single venue across London from Wimbledon, to the ExCel, to the Olympic Stadium. 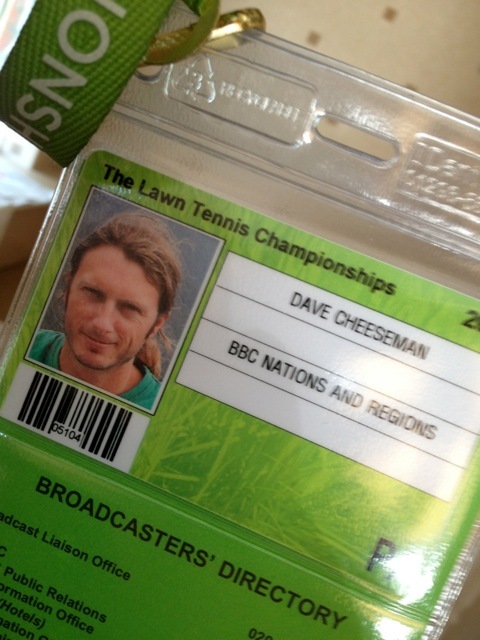 Wearing my ‘ALL’ accreditation before shooting a live broadcast outside the stadium. The borrowed BBC Sport shirt also proved useful for getting into places. It sounds brilliant, but there’s obviously a lot of work to do and getting the time to hop around watching sport is not really an option. You take what you can get in the short times you have between filming jobs, and often miss what everyone else is getting excited about. I probably watched less TV during the Olympics than I would do in a normal 2 weeks. 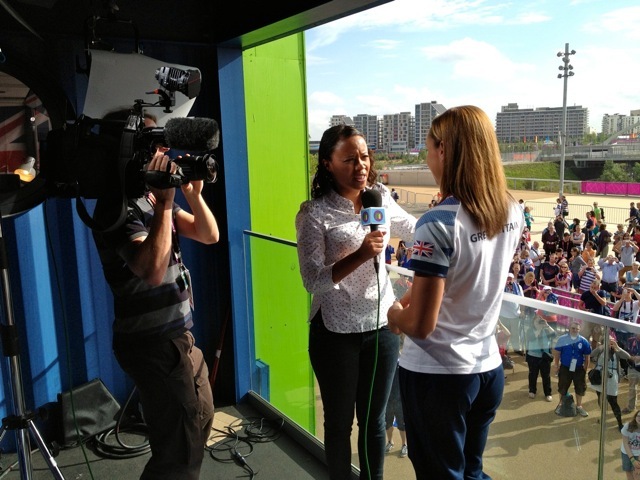 Just before the games started, we were allowed into the athletes’ village to do some filming and look around. It was quite surreal being there with hundreds of athletes from all around the world milling about. I filmed in the gardens, the gym, an athlete’s flat and in the canteen where I had the pleasure of seeing the entrance of one Usain Bolt. As he strolled through the canteen along with the rest of the Jamaican sprint team, everyone’s heads turned. He went off to get his lunch and then I filmed him again as he left. 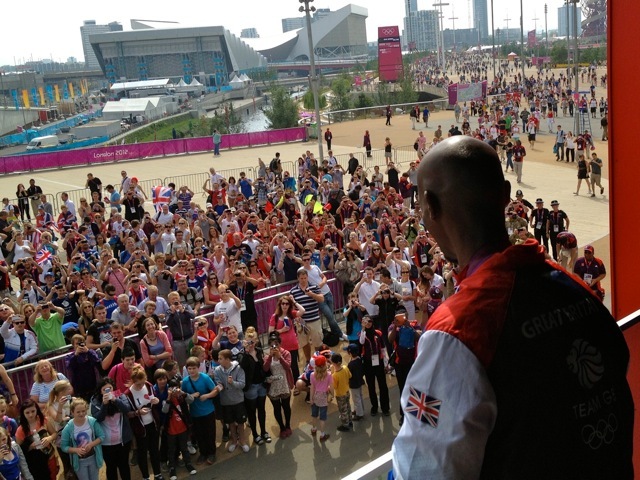 Even his fellow Olympians were crowding around to get photos and autographs from the great man. It was astonishing. I couldn’t find a link to the pictures which were all across the national news bulletins that day but there was clearly a Guardian snapper in the room too! 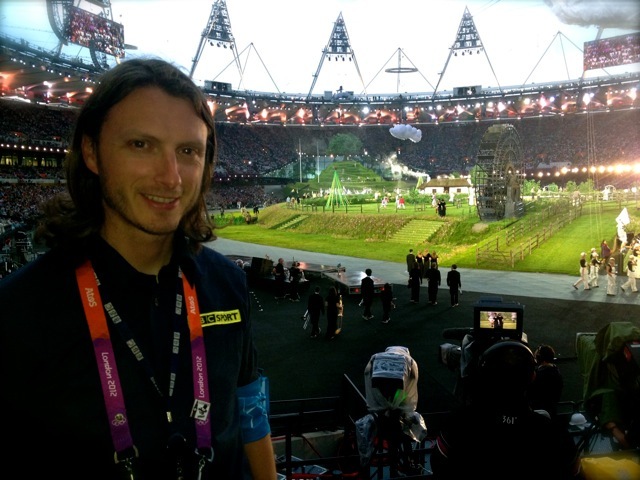 In the Olympic Village shortly after filming Mr Bolt – incidentally that grass is the softest I’ve ever walked on! I brought the footage back to the office and used it to edit six preview films for different regions. It was then that I got a knock at the door of the edit suite to say that a draw was being made in the office for 2 spare passes for the opening ceremony. I never win anything, but out popped my name and I was given a pass to go up to the stadium to witness history. I legged it up there and spent a while trying to find a spot. I eventually eyeballed a news camera crew from the BBC and went up to the platform they were occupying and stood with them. In the hour before the show started, the ‘green and pleasant land’ set was up and it was surreal. They had really created a serene atmosphere in a vast crowded stadium. Everything from the smoking chimney of the cottage, to the sheep milling about made it special. The heads of state arrived, the pre show ended and it was underway. Most people know what happened from now on and it seemed to be well received. From my vantage point the show was amazing. Highlights were definitely watching the James Bond film on the big screens and then seeing the helicopter appear live over our heads. Tony, the news cameraman I stood with, was very pleased to ‘get a shot up the Queen’s skirt’ as her stunt double leaped from the helicopter. The firework show was deafening from inside the stadium and it was a brilliant start to what would turn out to be the most fantastic two weeks of sport I’ve ever witnessed. 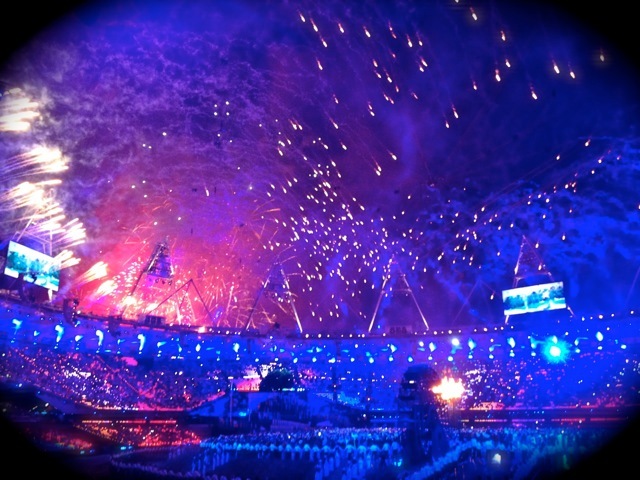 The fireworks were breathtaking – although I think the best view of them was from outside the stadium! 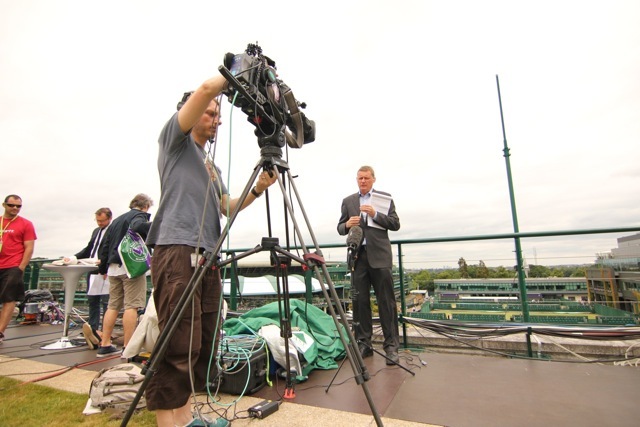 We arrived at Wimbledon after slogging across London with the camera equipment in order to interview the GB interest in the tennis: Andy and Jamie Murray in the men’s doubles; Laura Robson and Heather Watson in the women’s doubles; and Elena Baltacha in the women’s singles. I’d been at Wimbledon for the All England Championships at the start of the month and have worked there before but I’ve never been anywhere near centre court when a match is being played. We interviewed Elena after her 1st round match and I needed to feed the interview back to the International Broadcast Centre. I had been told that the feed point was on centre court, so I dashed off there following the signs for ‘Mixed Zone’ (the area where athletes are interviewed immediately post-match). On arriving it was apparent that a match was being played so I waited for a break in play to enter the arena. It was exciting to even get in there so I was blown away find that the match being played involved Roger Federer. 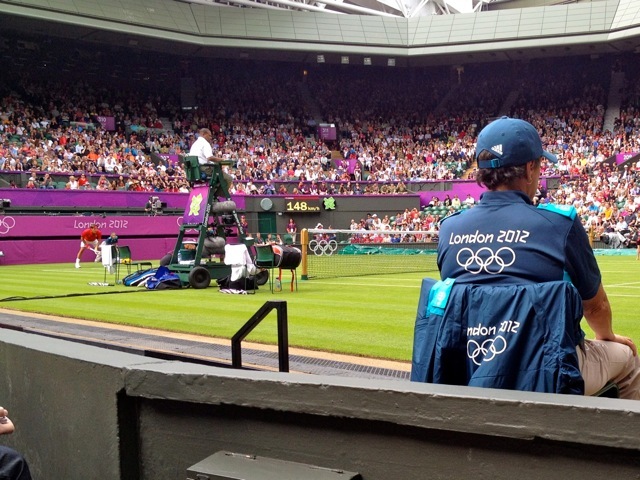 The mixed zone was literally on the front row, the seats that you never get unless you have serious cash. I sat there, feeding the interview down the line, watching the greatest tennis player of all time steamroller his way into the 2nd round. As if that wasn’t enough, he finished the game and immediately headed straight for me! Having not been in the mixed zone before I didn’t realise why until the NBC man next to me called him over for an interview. I also got a taste of how popular he is when the entire block of spectators rushed down and tried to get autographs. I was virtually crushed by Federer fans waving oversized tennis balls and felt tip markers. Being the nice guy he is he came over and signed a few, reaching around my camera lens as I filmed him. 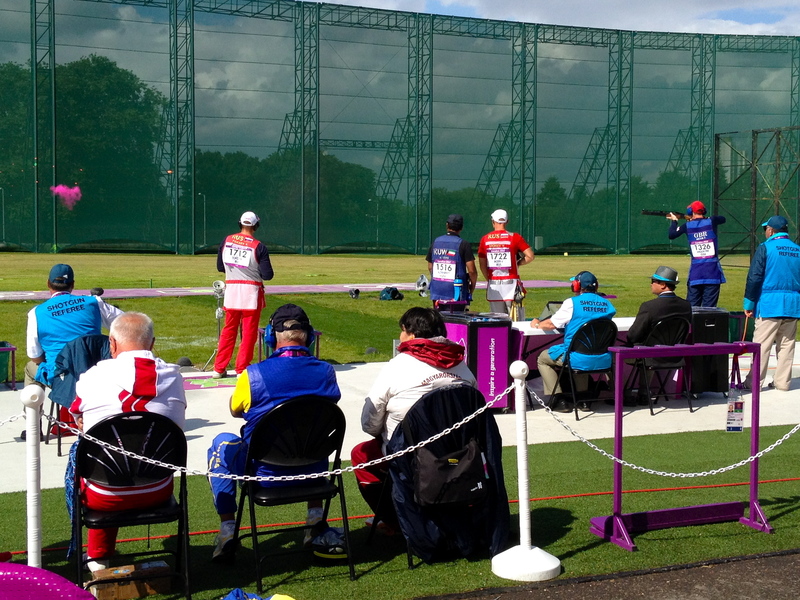 Peter Wilson hitting a clay from my position in the mixed zone – iPhone pic! Very lucky to catch it. Between the morning sessions, whilst Tanya was doing inserts for radio shows, I’d had a scout around the grounds to see if I could find any of Peter Wilson’s family. I got chatting to some Team GB-clad chaps and they pointed me towards his dad Charlie, who turned out to be a lovely bloke. I spent a while talking with him and then again after the 2nd round. He was nervous but confident that his son could do it, and we got on well. So well that when Peter did win gold and we were interviewing him, Charlie decided to jump into our mixed zone position to congratulate his son. It was a really special, emotional moment that will stick with me for a long time. To see your son achieve an Olympic gold medal must be amazing. The footage went right across BBC Sport outlets and to the regional programmes too. BBC Points West in Bristol did a great piece, using the footage really well. It was fantastic to be part of it. After a fairly quiet day, Tanya and I went up to the Olympic Stadium to film some pieces to camera for a documentary about Jessica Ennis’ preparations for the Olympics. Little did we know that it was going to be the greatest night ever for British athletics. The atmosphere throughout the whole night built into the most spectacular crescendo of noise for Mo Farah’s 10,000m win. The first 20 laps were a Mo-led mexican wave of noise as spectators stood up to cheers him on as he went past. the last 5 laps he had everyone on their feet and when he kicked out down the finishing straight the noise was immense. I will never experience anything like that again. Superb. We did our piece to camera from the camera platform overlooking the medal podium; you can see that in the documentary ‘Jessica Ennis: Golden Girl’ which, incidentally is a great watch. Well done to the team at BBC Leeds who put it together. In the morning, I’d been up at the BBC studio to interview Jess Ennis for BBC Leeds, BBC News and Newsround as well as another athletics hero, long jumper Greg Rutherford and two members of the victorious women’s team sprint cycling team. 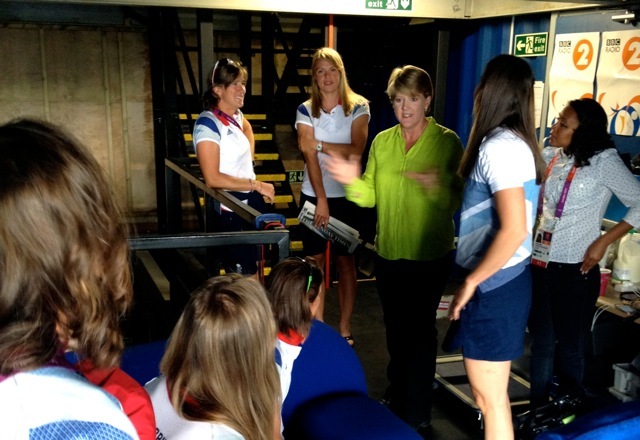 The day then got even better as virtually the entire rowing team had come over to the Olympic Park following the completion of their events. They came through the BBC studio to sit on the sofa for a chat, and as they left, we grabbed them for interviews with the regional TV stations in mind. I think I shook the hands of 14 gold medallists that morning. The day ended with an evening off and my thoughts immediately turned to the stadium and the 100m final. We sneaked back up to the same camera platform we’d filmed from the night before and managed to catch the night’s athletics. 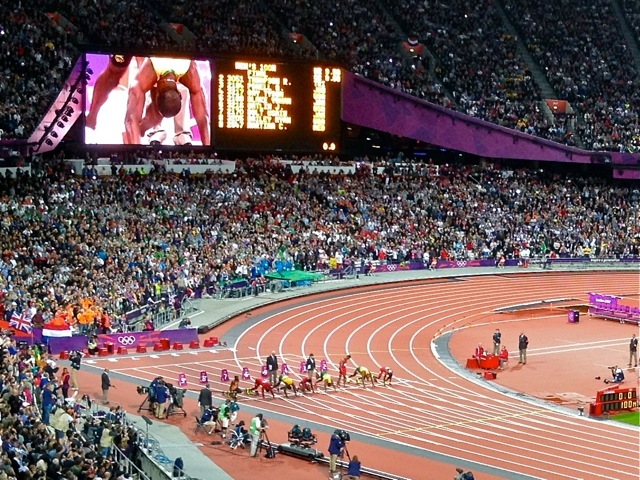 As amazing as it was to watch the 100m final live, it wasn’t quite as special as the previous night. Still, I was there! These days merge as a single experience because I don’t think I stopped for 24 hours! 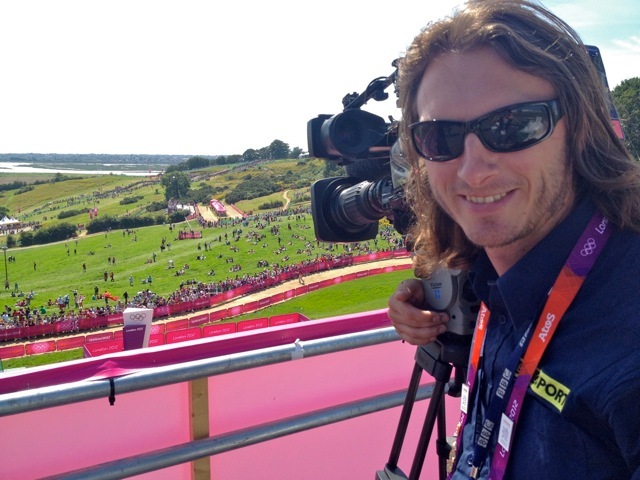 The Saturday had started early with another meeting to film the rowing team in the Olympic Village, but then had been all about mountain biking at Hadleigh Farm in Essex. We went up to the site to try and find the friends and family of Annie Last, the only GB woman competing that day. It turned out to be a tricky one. Nobody we met had any contacts for the family, and the site was huge. Still, with a positive attitude I set about wandering through the crowds to try and find them. I’d all but given up when I spotted a huge contingent of fans at the summit of one of the many ascents on the course. I shouted over the barriers and got their attention and found out that they were indeed who we were looking for and that there were tonnes of them! It made great TV, we interviewed mum, dad, brother, school friends and even Grandma who was local to the area and chuffed to bits to see her granddaughter competing at the Olympics. We headed back into London after filing the footage and after a bit of editing decided to head over to the stadium to catch Mo Farah’s second attempt at gold, the 5000m final. As with ‘Super Saturday’ the atmosphere was immense. The whole nation seemed to be willing Mo to win. I know there were some great achievements throughout the games, but for me his stood out as the most exciting and captivating. Maybe it was the fact that I was there! The next morning, I again headed to the BBC studio and interviewed Mo along with fellow gold medalist, Luke Campbell (from my hometown of Hull!). The crowd below the balcony were loving it, all doing the ‘Mo-bot’ and chanting his name. I’ll never forget that either. That night we watched the closing ceremony with a few beers. It seemed surreal that it was all over. I expect that those 2 and a bit weeks will be the highlight of my career but, you never know, something could top it! It was fantastic and I was privileged to have the experience. Although I expect people all around Britain have their stories of where they were for certain moments, and there are parts I wish I had seen on the TV which I’m only just catching up on now (thanks to the brilliant work by my colleagues at BBC online), It was a unique place to be for the only home Olympics I expect I’ll ever see. 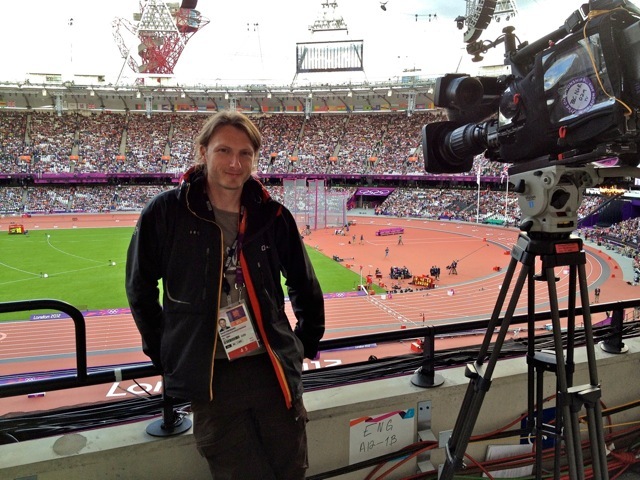 I hope to do it again at a future Olympics, but first up is London 2012 Paralympics which start in a few days. I’ll be working for the same IPC team that I joined for Vancouver 2010. It promises to be just as special. I know it hardly feels like summer (that was way back in March I recall), but the most anticipated few weeks of sport in recent times is upon us. I can hardly wait. I travel to London a week today and will spend the Olympics in the thick of the action working for BBC Nations and Regions, filming as many success stories for the team GB athletes as possible, along with the inevitable heartbreaking failures. I’m all set to go and have accreditation in hand along with my free travel Oyster card (woop) for the duration of the games. 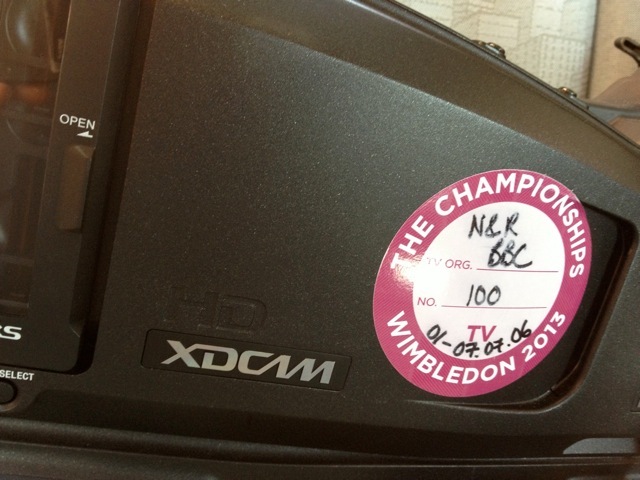 I put my camera kit through it’s paces the week before last at Wimbledon and all seemed fine, apart from a few niggly problems which have now been ironed out. As ever, Wimbledon was a great place to work and it was made all the better by Andy Murray winning through to the final day. I spent the week filming British juniors and the remaining interest in the seniors, namely the men’s doubles, and Andy Murray’s training sessions over on the practice courts. 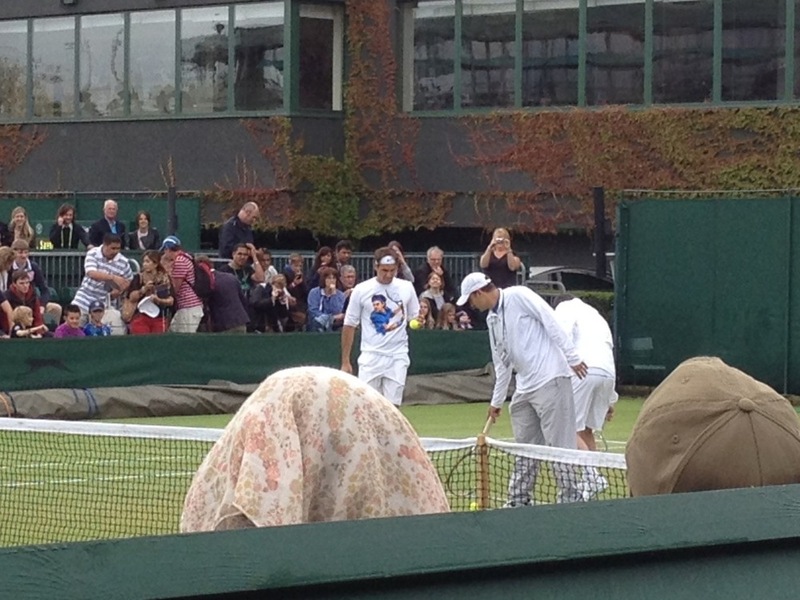 Getting shots of Andy and coach Ivan Lendl – Note the raincoat. It was a shame to see so many of the juniors exit in the early rounds, including the impressive Liam Broady whom I’d followed all the way through to the final last year. Let’s hope some of them can progress into the seniors next year. Still, the seniors came up trumps and it was great to film the early rounds of Jonny Marray’s thrilling run to the men’s doubles title. Having filmed him and his partner, Freddy Nielsen, from round 3 onwards I had to sneak up to centre court to catch a bit of the final. Once the players get through to matched on the show courts (1,2,3,12,18 or centre), I leave it up to the on court crews to get the match action while I concentrate on post match interviews. 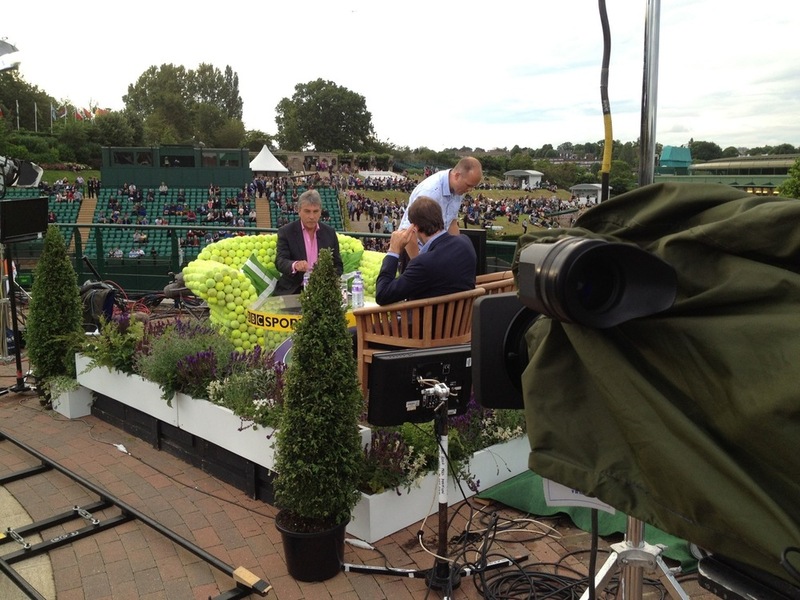 For the men’s final itself, I flitted between filming a jam packed Henman Hill, the broadcast roof where Jon Inverdale was presenting from a rather strange tennis ball sofa, and court no 2 which was packed with yet more people watching on big screens. It was a shame to see Murray miss out, but Roger Federer is a class act who deserved it on the day, even if he does train wearing a shirt with his own face on it! Federer wearing a Federer shirt. I might get a Cheeseman one. Despite the weather it was a great week, I know many people are worrying about the conditions for London 2012 and I must admit, it was warmer in Vancouver in the build up to the Winter Olympics than it has been over the past week or so in London! Hopefully the warm glow of GB success will keep us happy. Having spent (most!) of the last 11 years of my working life based in Nottingham, I’ve decided to move up to Manchester to join a new team of technical staff working for BBC Breakfast News, Newsround as well as the regional programmes in the North West of the UK. Following the much talked about move from London, BBC Breakfast launched this week in a brand new HD studio based in Salford Quays. I began my first week in the new job editing for the program which involves being in overnight, but I hope to get into some film making and various other aspects of the job in the near future. The new studio is state of the art (if a little small!) 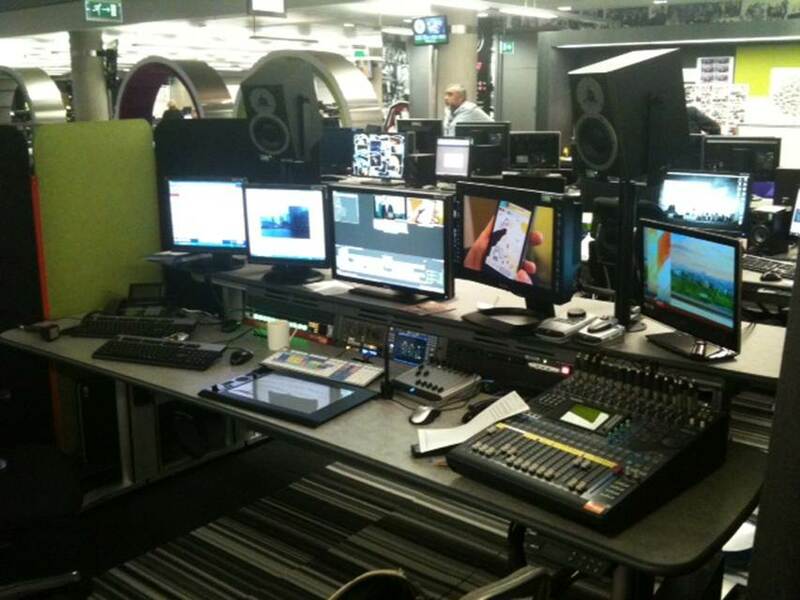 compared to Breakfast’s former home in BBC Television Centre, London. It’s green, using roughly 10% of the power consumed by the old studio thanks to an LED lighting rig. Public response mainly seems positive so far, although there have been many comments about the new close-up shots of the presenters and the ‘garish’ colours of the new set! Come 8.30am the celebs start shuffling in to the green room area by the studio. So far I’ve had the pleasure of being feet away from Shaun Ryder, Labrinth the Inspiral Carpets, and of course the BBC breakfast presenters who seem like a pleasant bunch. Camping on the beach. What a great idea. You get a nice soft bed and you can hear the ocean all night washing in and out. Even better, it costs just $10 a night for a pitch, What could possibly go wrong! It definitely sounded like what Nich told me is ‘type 1 fun’. This is the type of fun where the proposed activity sounds like fun and then when you do it, it is actually fun (e.g sitting in a hot tub with a beer). ‘Type 2 fun’ is something which sounds like fun but isn’t fun whilst you do it, but on reflection, the stories you get out of the experience are great (e.g. climbing a really tough mountain). FInally there’s ‘type 3 fun’. This is where the activity sounds like it will not be any fun at all, and when you do it it really isn’t but when it’s over you get a great sense of achievement or a life changing experience (e.g running a marathon up over a mountain range whilst carrying a bag of cement). We were on our way from Los Angeles to Vancouver, BC and, with a fairly low budget, had agreed to buy a tent and camp for much of the journey. Leaving Los Angeles and heading north through Malibu, we soon encountered the California State Park system. There are a number of variations but all tend to offer decent camping facilities which range from basic/primitive (just toilets) to developed/family (showers, wash blocks etc). The first stop we made was at a place called Pismo Beach which is at the southern end of the area known as Big Sur. 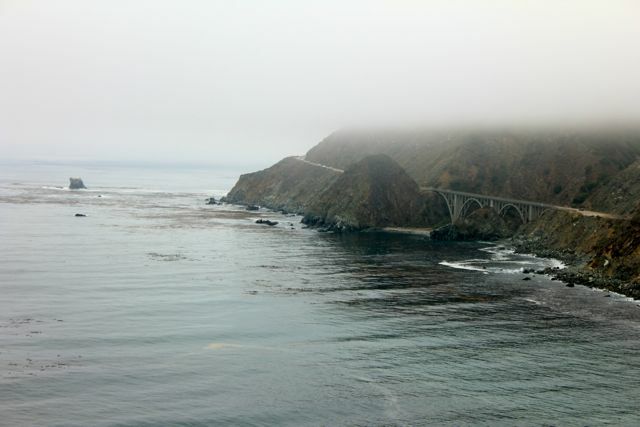 This is a beautiful part of the world where US Highway 1 runs along the Pacific coast. The beaches are fabulous and the scenery breathtaking. What a place to camp! We arrived at Pismo to be greeted by a friendly park warden who told us to grab some wood so we could have a fire and then head onto the beach. 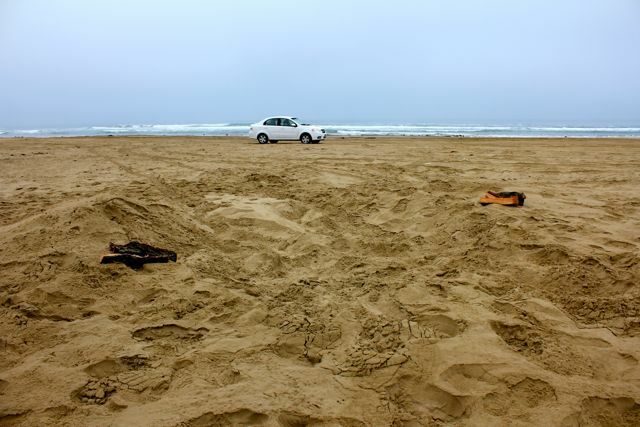 “Just stick to the side of the beach nearest the sea when you rive up there” she said, eyeing our front wheel drive Chevrolet Aveo which we had rented in Los Angeles the previous week. I was at the wheel and got stuck in, zooming down the ramp onto the sand. It was brilliant. There were hardly any people around as we zoomed up the beach, right by the waves. Driving up the beach is great fun. Even in a 2 wheel drive Chevy! Soon we saw a few campers, mainly in large trailer caravans and RVs, dotted along the beach away from the water in Mad Max style groups. 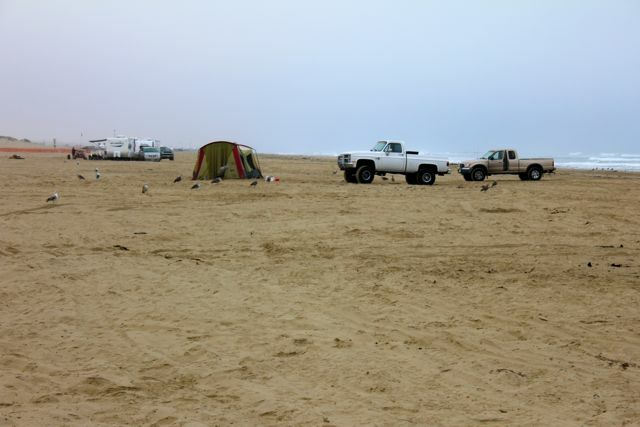 This is a popular area for off road dune buggy riding and almost everyone is in a truck, and a big truck at that. We were aware that the tide had been high about 4pm and now it was getting toward 6pm. I don’t know about you but I’m not the best at judging tides. How far WILL the water come up the beach? Well, best to use local knowledge and do what everyone else is doing. So, after exploring up and down the coastline for a short while we chose our spot and pointed up the beach towards land to park. That’s when the problems started. I spotted a suitable spot for camp and aimed the car up the beach. About 10 yards off the damp sand it became abundantly clear we were going to have difficulty going any further. The car stopped and the wheels span. We were totally stuck. I got out and moved some of the bone dry sand away from the front wheels and had another go at getting out. No luck. Nich then tried and I pushed but we just dug ourselves in deeper and deeper. A couple of our fellow campers wandered over and pointed out that we should have backed up the beach, but even then though we probably would have had trouble. Then a friendly chap called Roger headed over to us in his truck and offered us some advice. “You won’t get that out of there” he said, “I can lend you a shovel if you like”. Meanwhile the beach patrol had been over and offered their services to drag the car out for $50. By now it was getting dark. We hadn’t set up our tent yet, but, being northern, there was no way I was going to pay a guy to drag us out when I could dig out for free. So we decided to leave the car there for the night and set up camp. It was now dark and a swarm of king-sized mosquitoes had come out to play. We madly tried to set the tent up as quickly as possible but the first time setting up a new tent is never easy. Eventually it went up and I started digging whilst Nich got the dinner on. Throughout the evening we dug all of the sand out around the car. A hole of around three feet deep was eventually excavated around the entire car and we went to bed, totally exhausted. The next morning, we emerged from the tent at first light to see Roger heading over in his truck. He hopped out and congratulated us on our efforts. Then he let our tyres down to 15psi and offered to help push. I got in the drivers seat while Nich and Roger pushed and we got out at the second attempt. 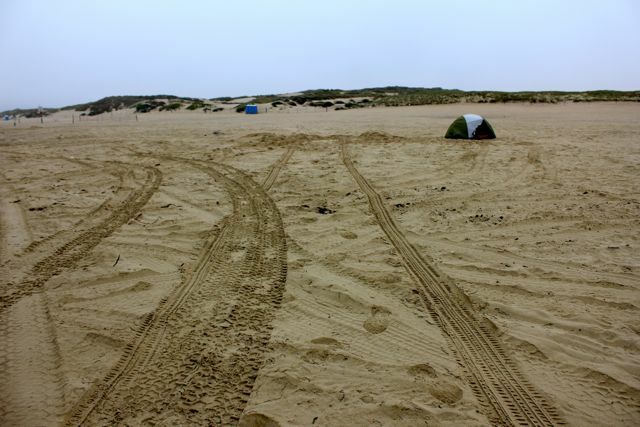 Whoops and high fives all around as well as some valuable lessons about camping on beaches. As if to congratulate us further, a huge migrating flock of sea birds swept passed us as we were packing up our tent, It was utterly spectacular and the end to one of the best experiences of the trip. Sometimes you have to get into a bit of trouble to enjoy yourself. i think Nich calls it type 2 fun. The flock of birds sweeps past. Amazing! Less than a year after leaving, the wife and I were back in Western Canada, this time for a visit and a holiday. 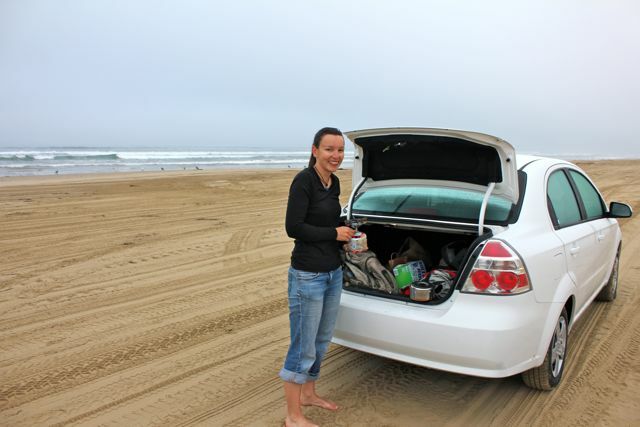 We’d attempted to do the drive down the Pacific coast from Vancouver to Los Angeles in Autumn 2010 but only made it as far as northern Oregon. I was stood in Portland Saturday market eating a rather tasty Philly cheese steak sandwich when I got a call from my sister in the UK to say my Grandma had had a heart attack and was very ill. During that day she got worse so we made the decision to abandon the trip and return to the UK. This left us with a half completed trip and a strong feeling that my Grandma would not wanted to have stopped us doing the trip and that we should finish it off this year. We started back in Vancouver to see our friends and remember why we loved the place so much. One of these loves was the mountains and how easy it was to access the best places in the world for outdoor activity. So, two days in, off we went to Whistler for a days mountain biking. Nich came along this time too after a weekend training course in the Welsh hills. It was an amazing day. Great weather, great riding and great for Nich to finally have a go on a full Downhill rig! This time around, and after my week in Les Arcs in the French Alps, I attempted some of the more tricky runs. But the super fast, jump heavy highways like ‘A-line’ and ‘Crank It Up’ are still my favourite experiences on a bike. I knocked together a short video with the help of some music from ‘Clutch’. “Grab your camera, they’re looting shops just down the street”. I grabbed my Sony DSR-570, it’s not small and weighs about 8 kilograms, and a rucksack containing microphones and spares. The BBC in Birmingham is housed in the Mailbox, a shopping centre in the heart of the city. It didn’t take long for us to meet up with our security guard and get across to where trouble had started. We joined a line of riot police as a group of masked youths began smashing the windows of Marks and Spencer a hundred yards up the road. The police charged and we followed, but the kids ran leaving broken windows and the objects which they’d used to break them, bottles of spirits. A short while later we wandered around to Moor Street station to find a burning car. There were a lot of kids around but the atmosphere wasn’t threatening and I started filming. Within a couple of minutes I got a tap on my shoulder from our security guard who suggested we get out of there. I looked round to see that the kids had been replaced mainly by masked youths. The kids, in hindsight, probably were the masked youths. We got out as quickly as possible to see that the police line had moved back and we had suddenly, briefly, found ourselves right in the thick of it. As we headed back toward the police line the officers shouted at us to get back. The big camera came in useful (along with a press pass) to wave at them to say that we were press. As we approached the line we realised that there were bottles flying from around the corner they were ensconced at. I got a shout of ‘Bottle!’ as a Smirnoff Vodka bottle, complete with optics, came flying over our heads, landing just behind the police line we were approaching. We ran through the line and retreated out of throwing distance before commencing filming. The kids were now turning their attention toward the police so we decided it best to retreat back to the safety of the Mailbox. The next day I was awoken by a phone call to get to Winsom Green, a segment of the Birmingham metropolitan sprawl. Overnight, three men had been hit by a car as they stood on the street to defend of their neighbourhood from looters. Sadly, they had all died that night, and now the police had opened a murder investigation. When I arrived the scene, the forecourt of petrol station on a usually busy street, was quiet. A few members of the community stood outside shops, but the majority of people there were police and press. The forensic teams examined the scene and gathered evidence. People started laying flowers and gradually, throughout the day, the community gathered, many of them had been up all night outside the local hospital waiting for news. The father of one of the dead men spoke to the press. He spoke for everything that was wrong with the events of the past few days, and brought it back into reality. I believe that his words had more effect in ending the riots than anything else. As much as the media had it’s part to play in spreading the troubles across England, this event demonstrated the power of the media in spreading the message to stop. I eventually returned home late that night having worked somewhere close to 35 hours in 2 days. My work had led the national news bulletins for nights and the experience is something I won’t forget quickly.